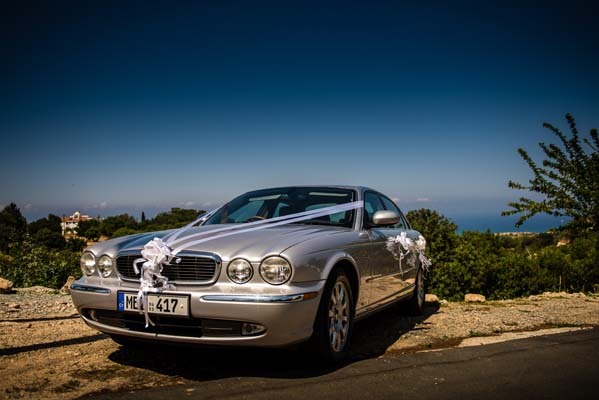 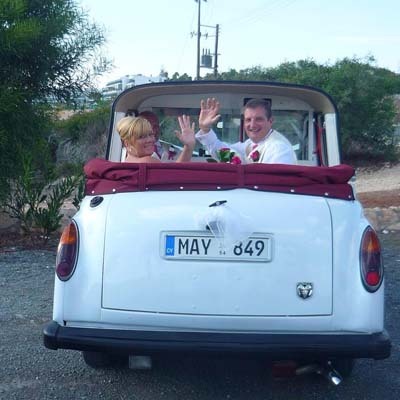 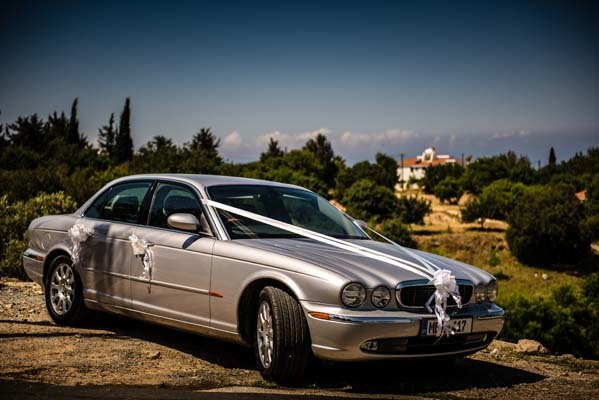 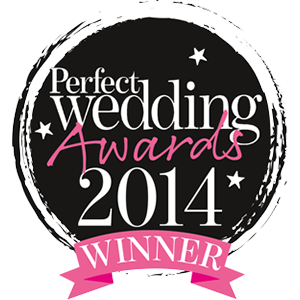 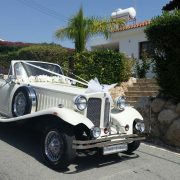 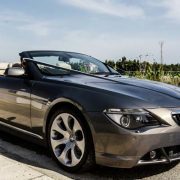 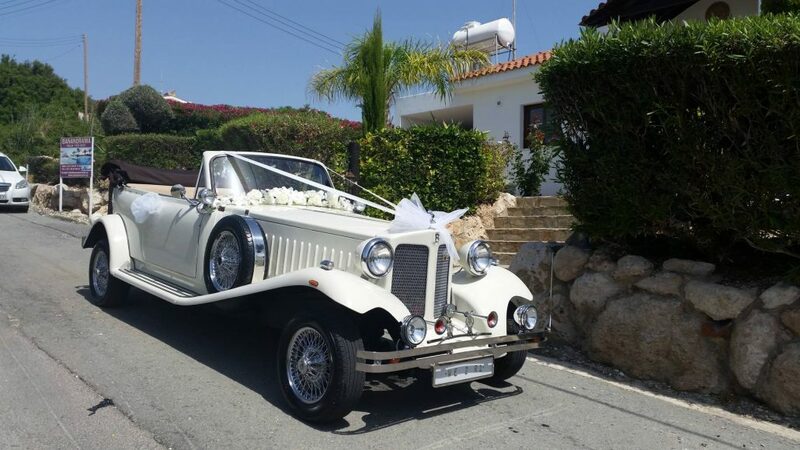 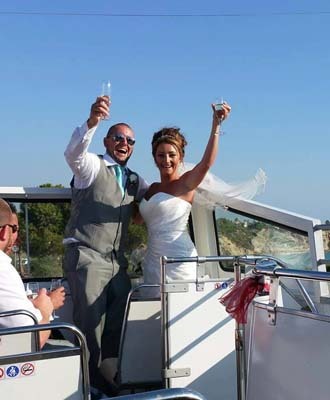 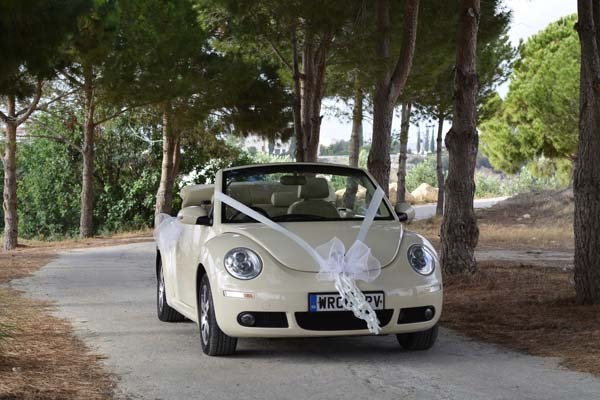 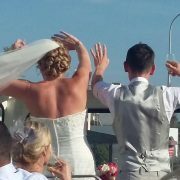 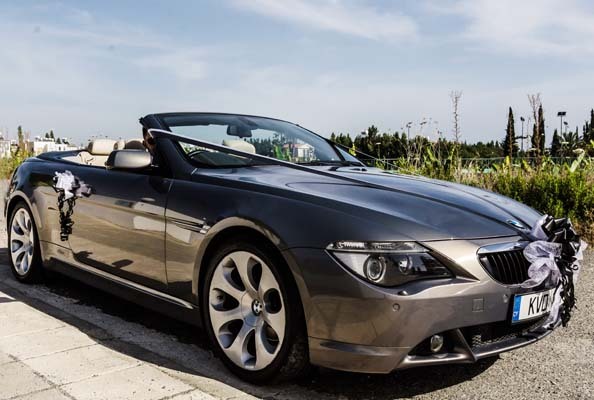 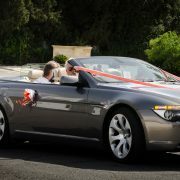 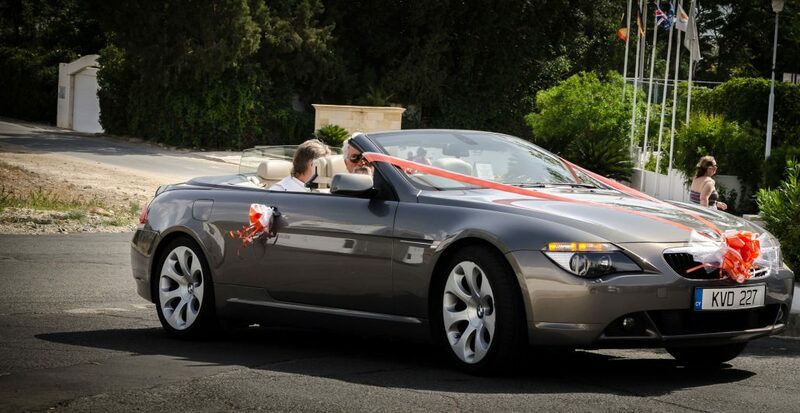 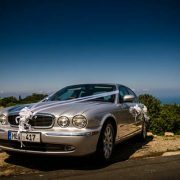 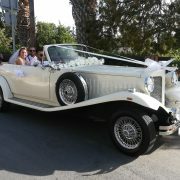 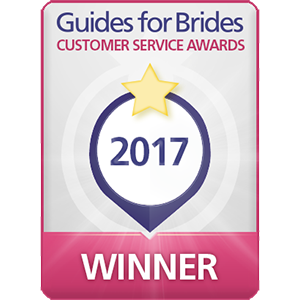 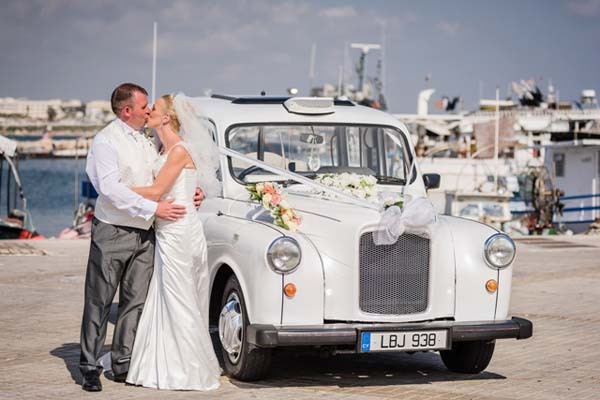 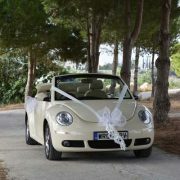 We have Stunning Wedding Cars, VIP Coaches or even Yachts if you’re interested? 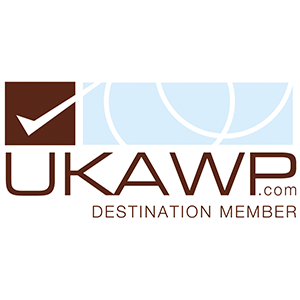 Check out our other sites for more information. 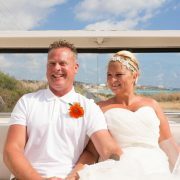 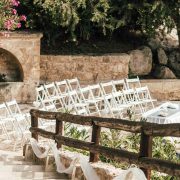 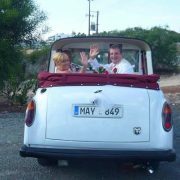 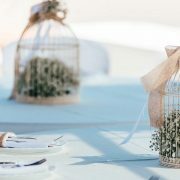 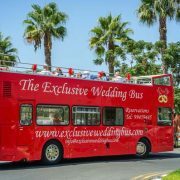 We pride ourselves on a level of service no less than 5*, having taken the 5* customer service awards 2015 in the Uk over 55 countries and we are the markets leading No 1 supplier for First Choice, Olympic, Thomas cook weddings and TUI, along with the main choice of wedding planners here in Cyprus.We have Red, White, Ivory buses along with a great selection of wedding cars too! 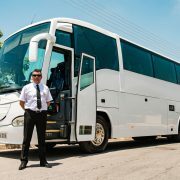 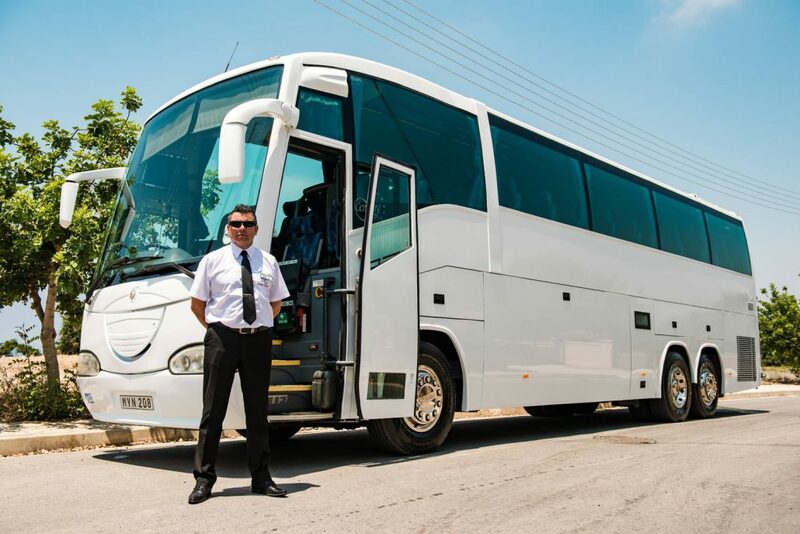 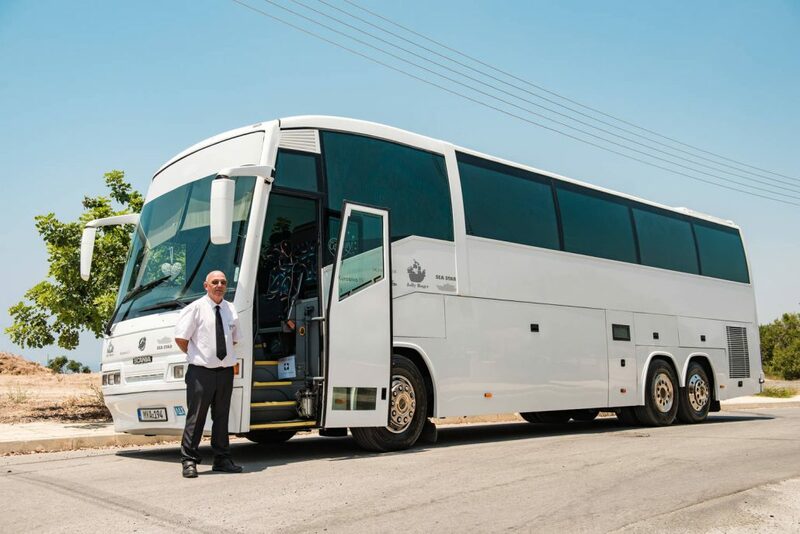 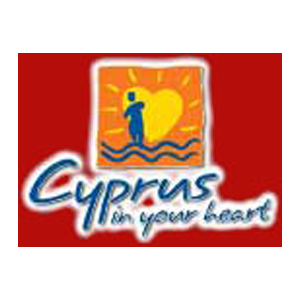 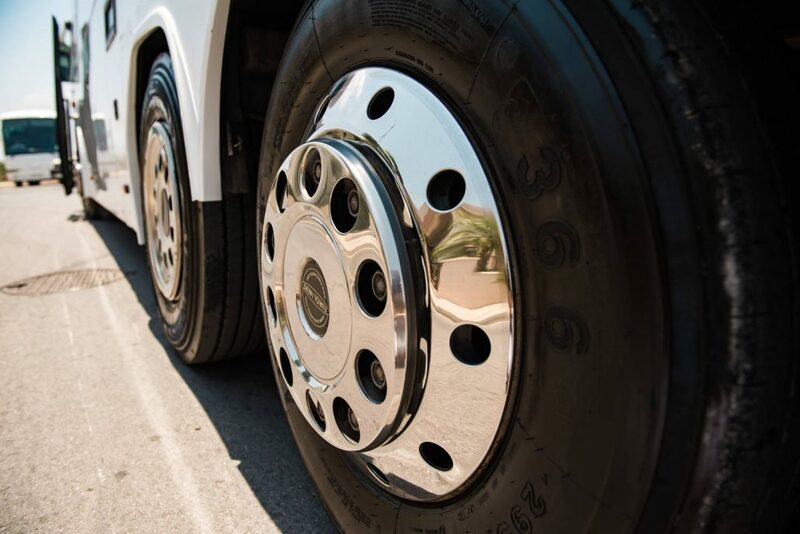 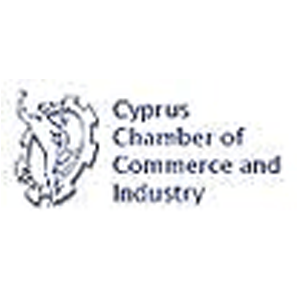 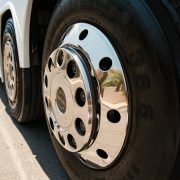 All our drivers are uniformed and are the most pleasant drivers in Cyprus. 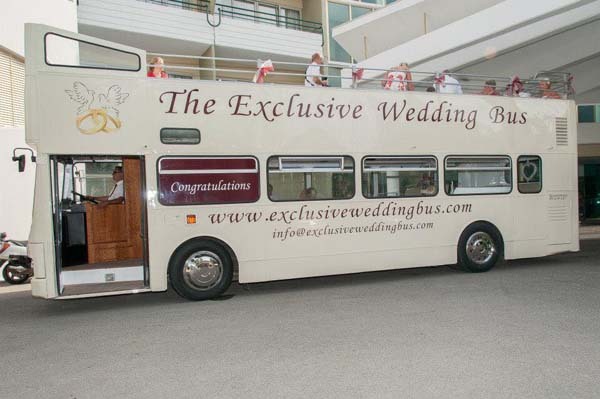 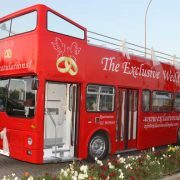 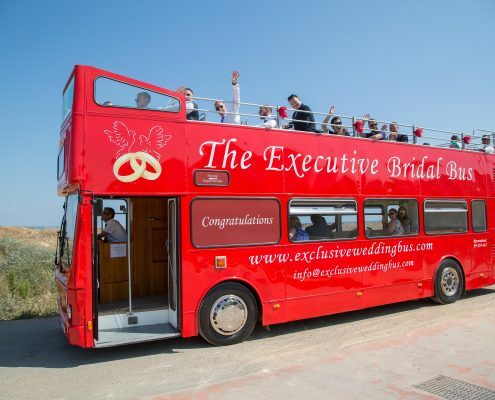 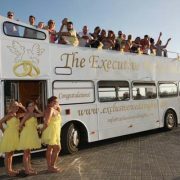 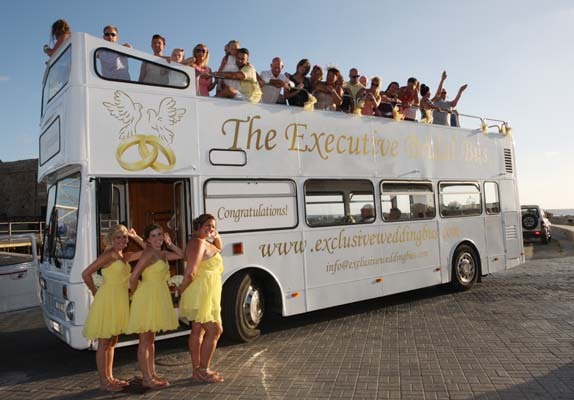 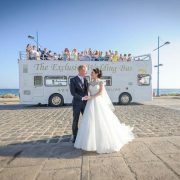 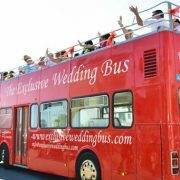 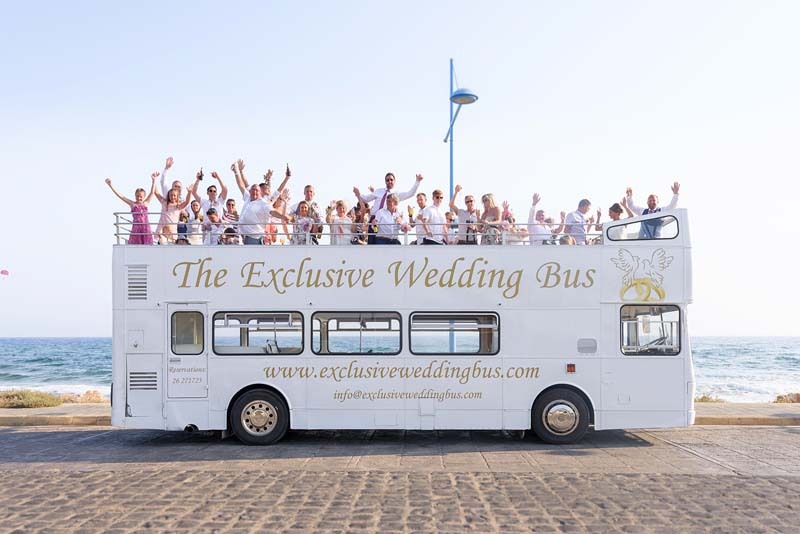 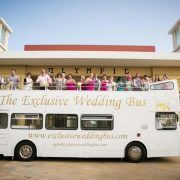 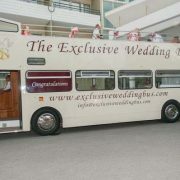 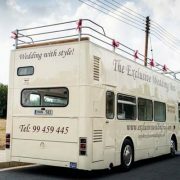 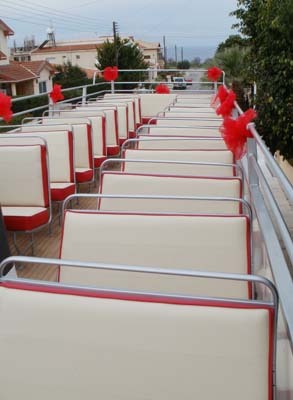 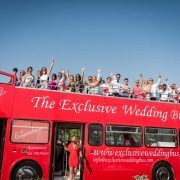 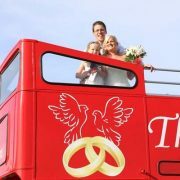 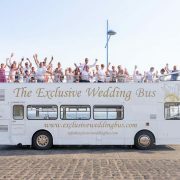 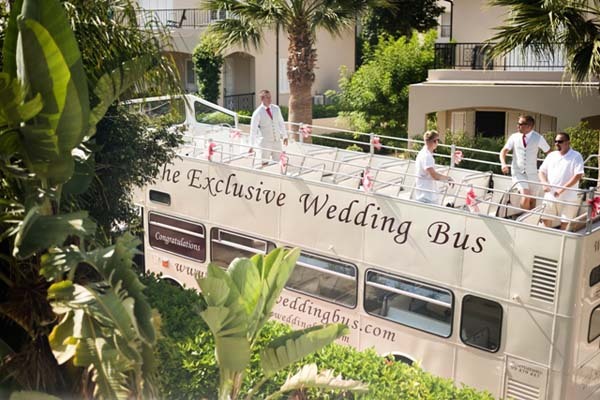 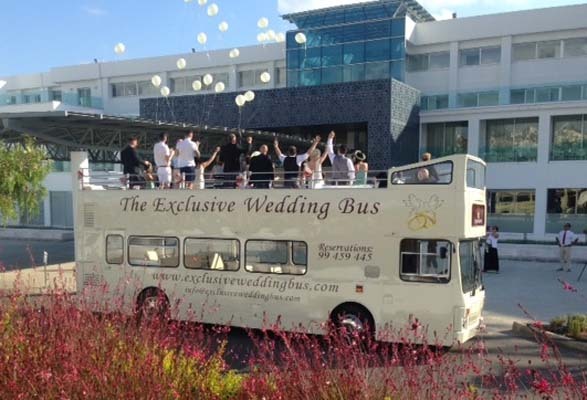 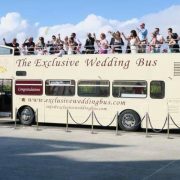 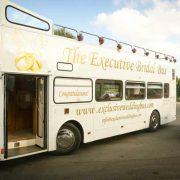 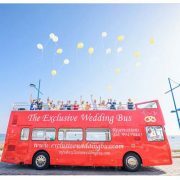 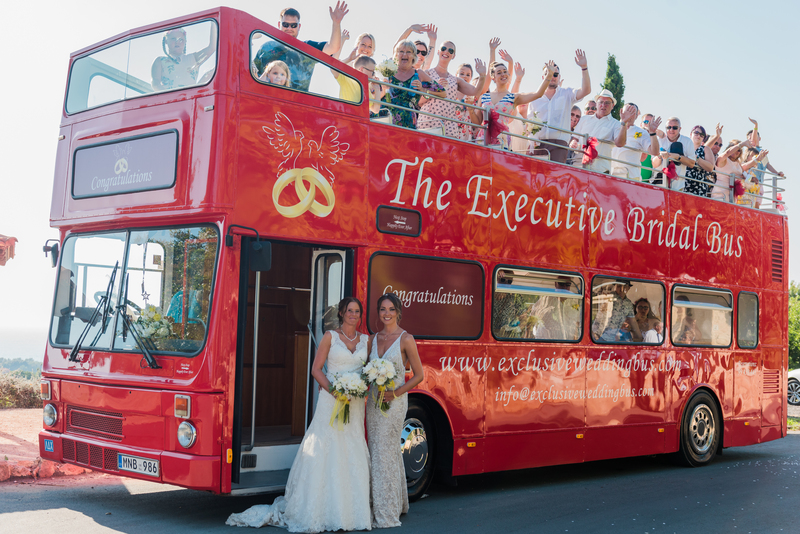 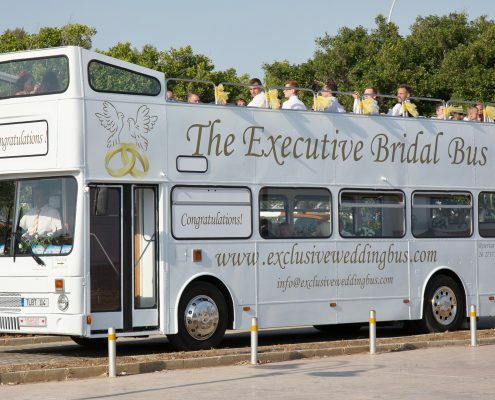 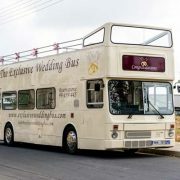 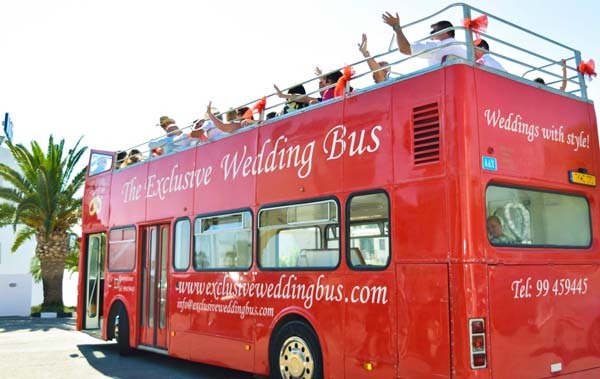 How many people can the Exclusive Wedding Buses Transport? 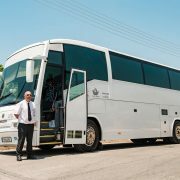 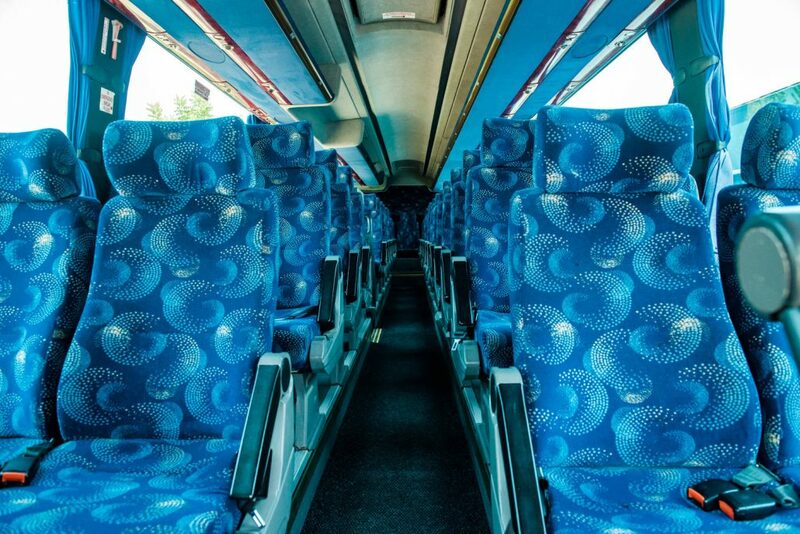 The buses are licensed to carry 74 passengers all seated. 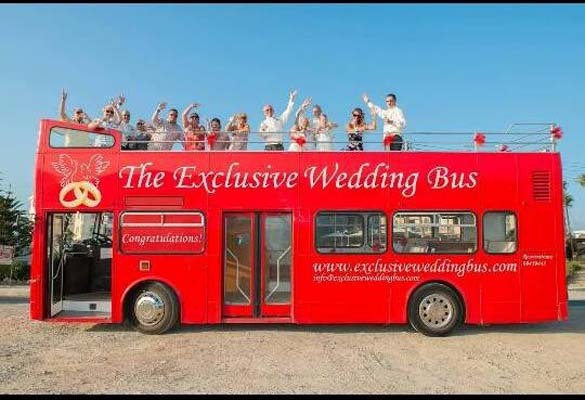 I only have a small party of guests, can I still book the Exclusive Wedding Bus? 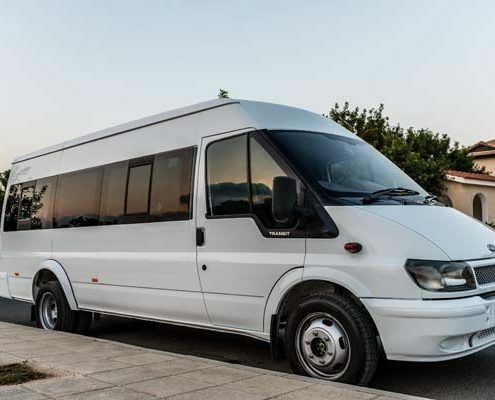 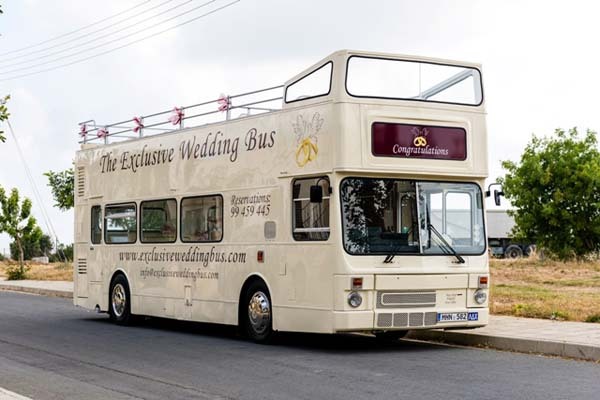 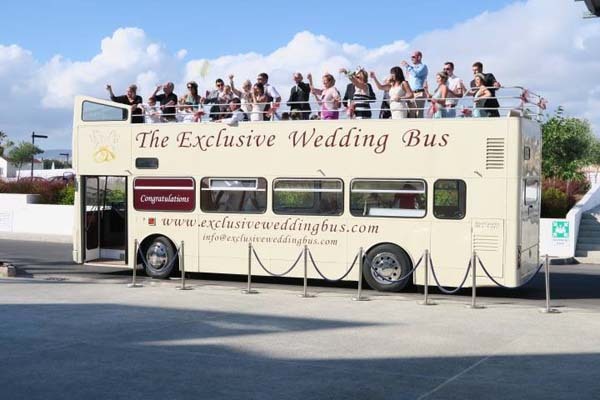 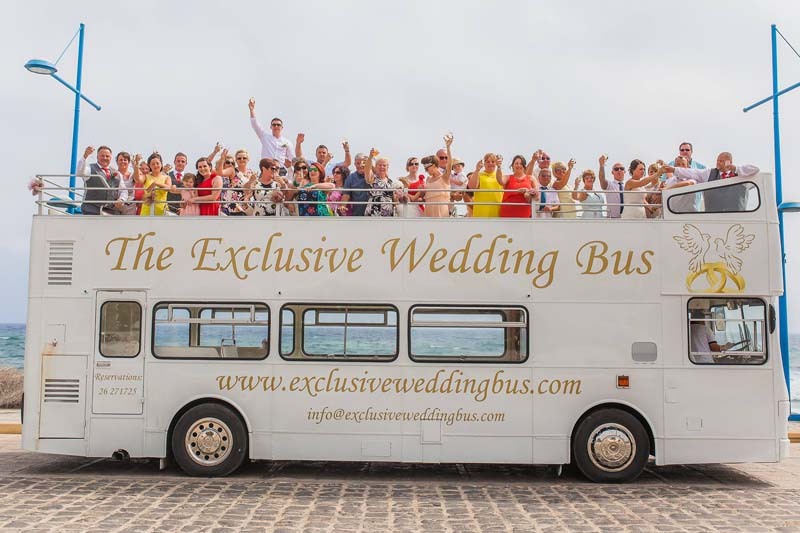 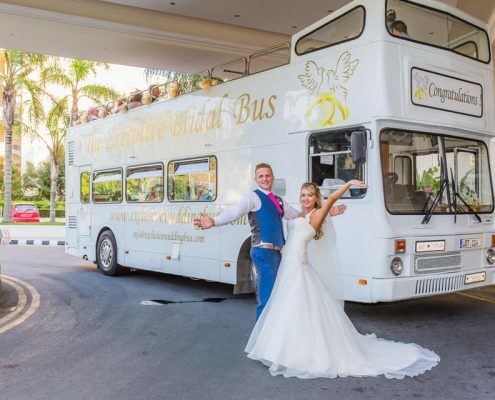 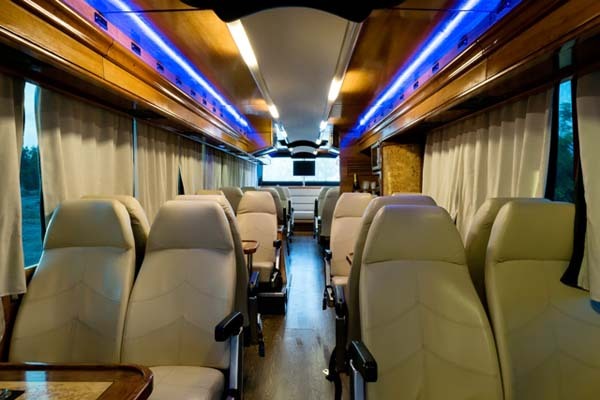 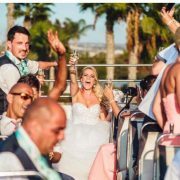 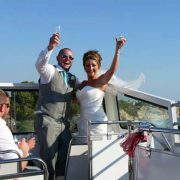 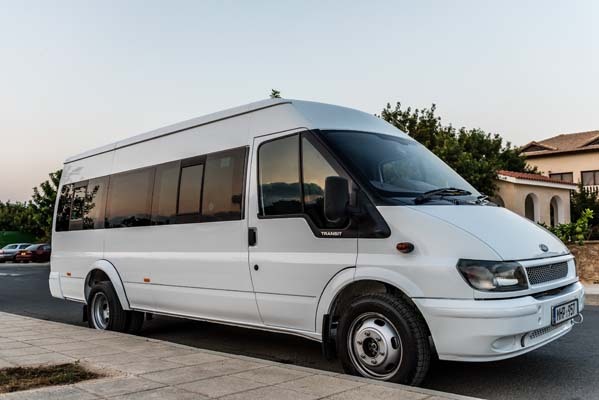 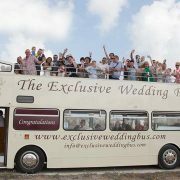 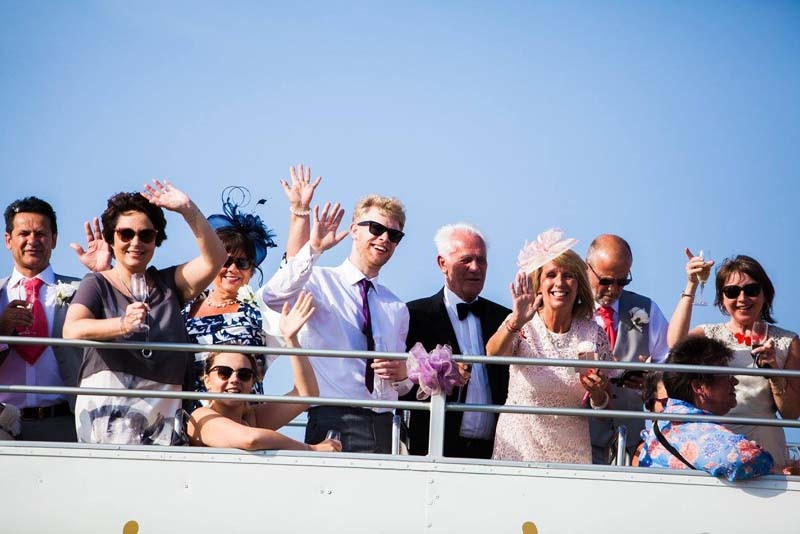 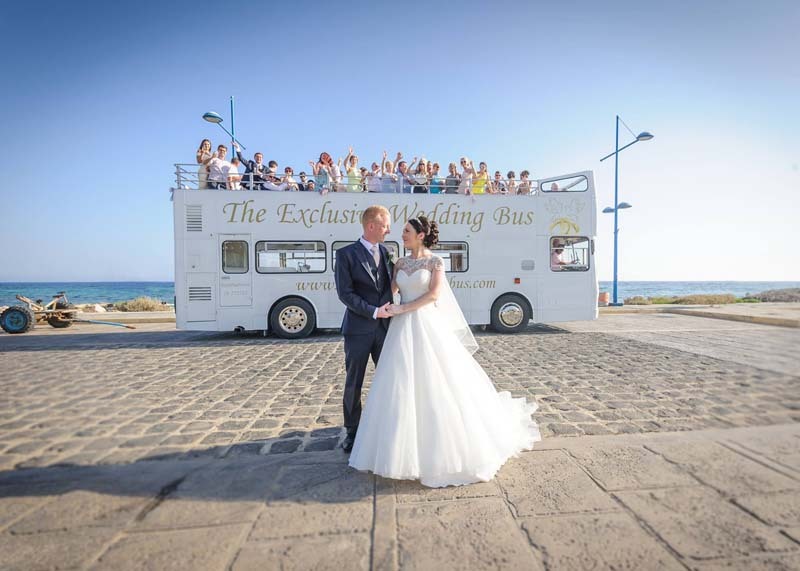 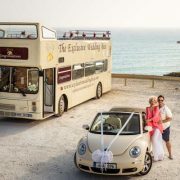 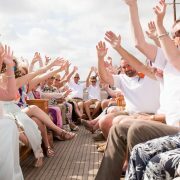 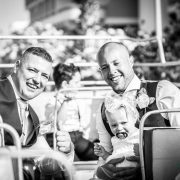 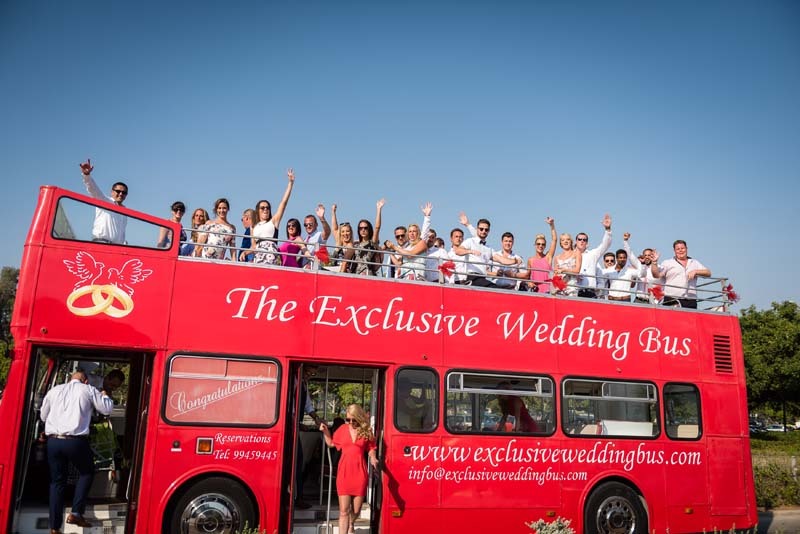 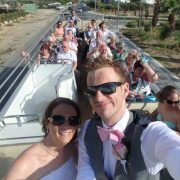 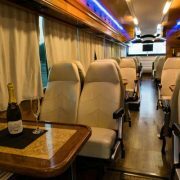 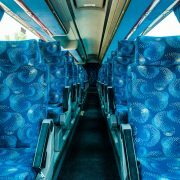 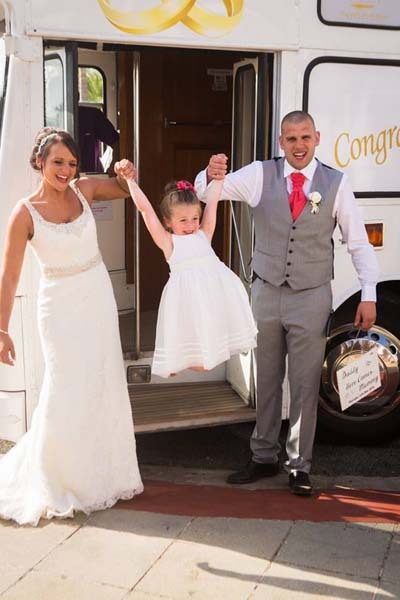 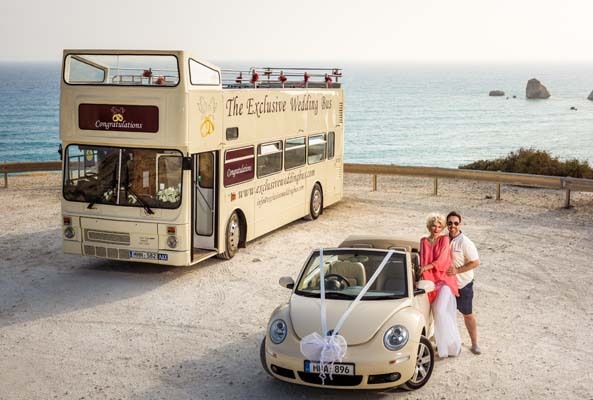 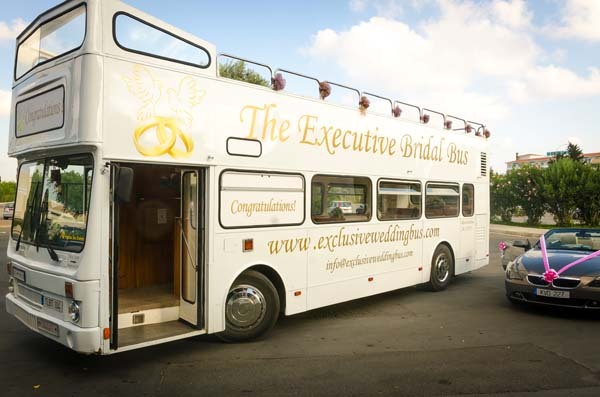 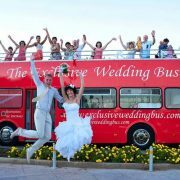 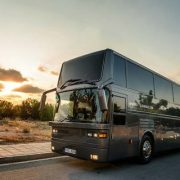 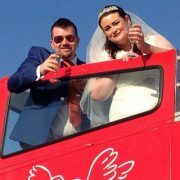 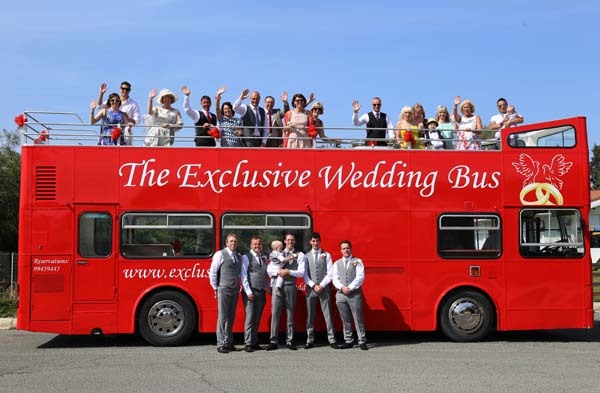 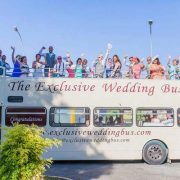 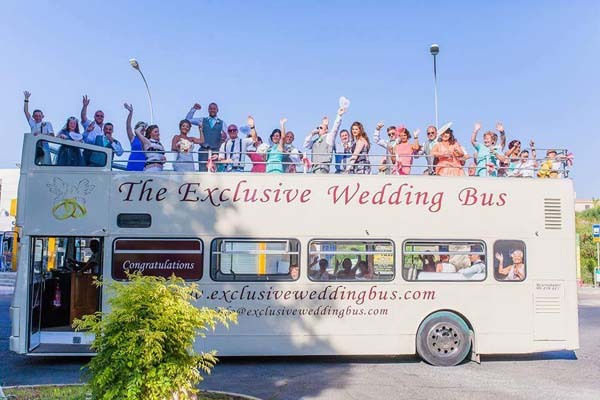 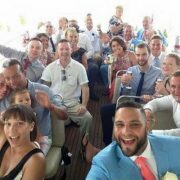 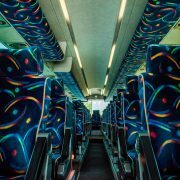 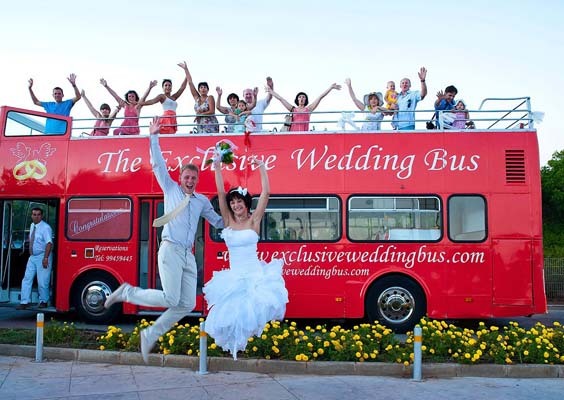 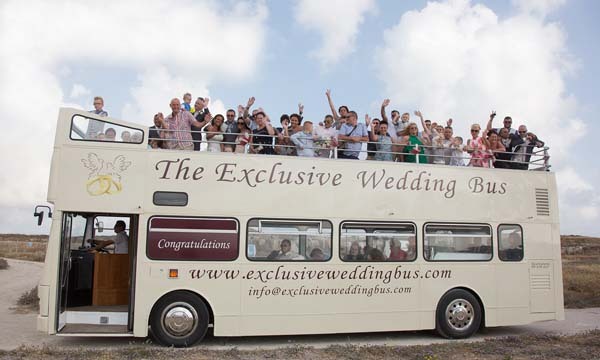 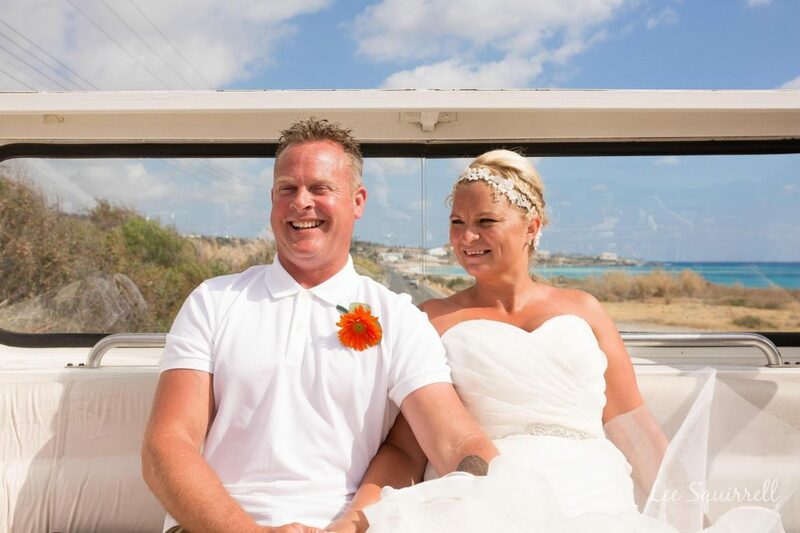 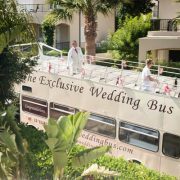 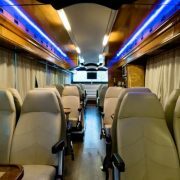 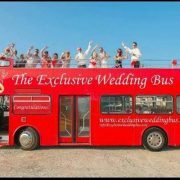 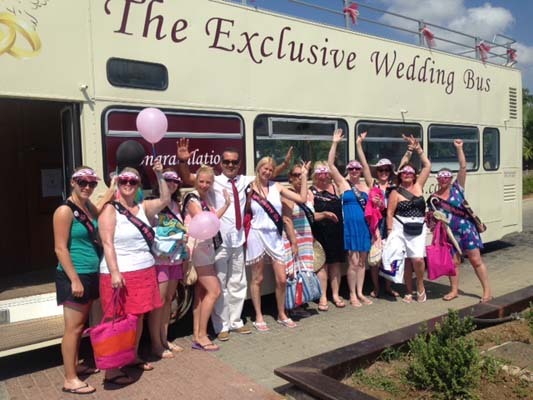 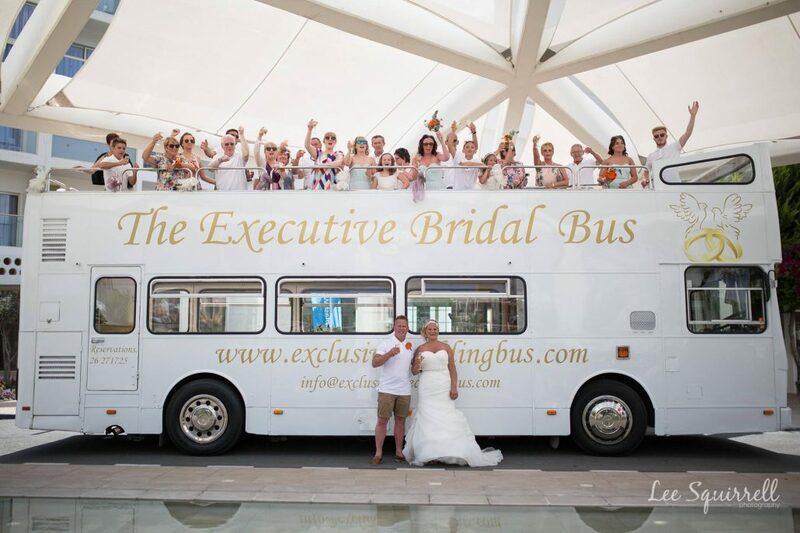 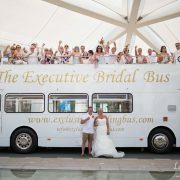 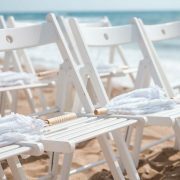 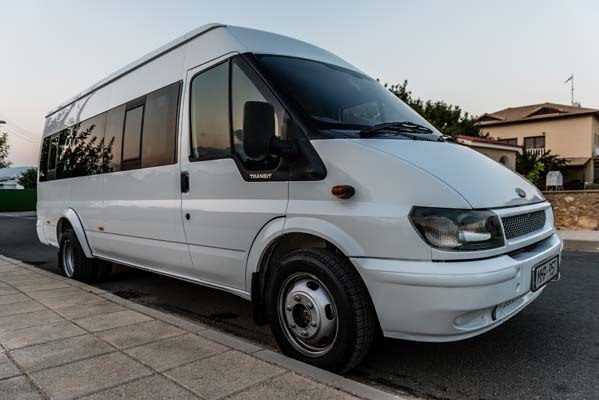 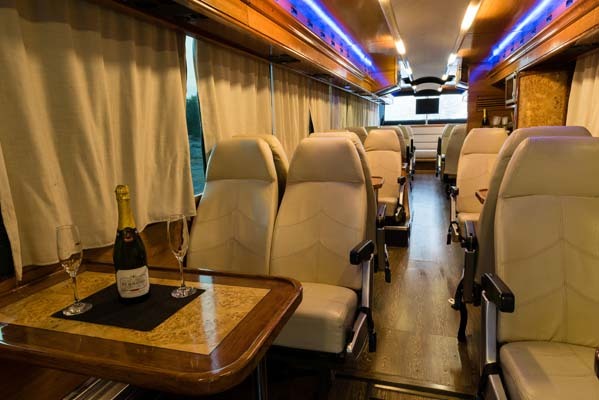 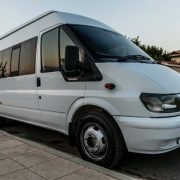 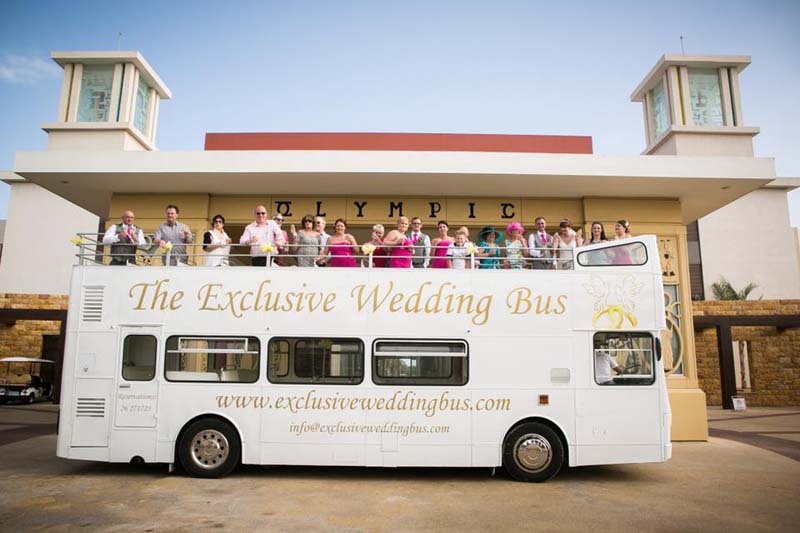 There is no minimum limit on the number of people that are able to book the Exclusive Wedding Bus, as you hire the entire bus and driver for what ever is required. 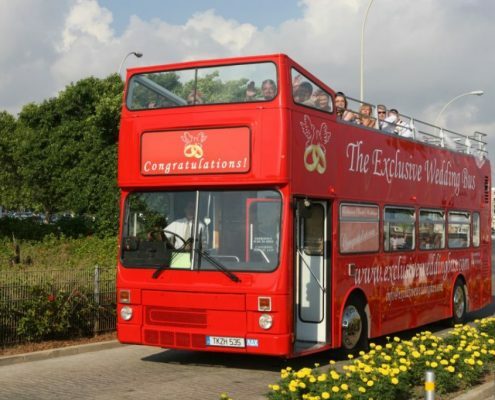 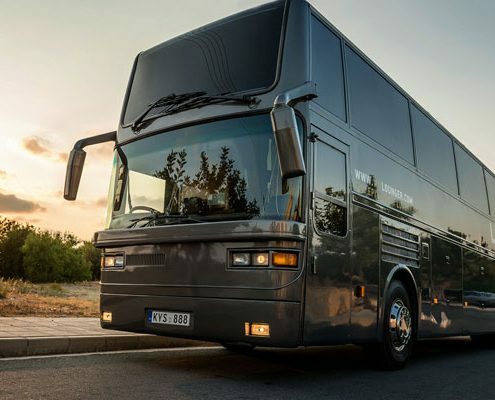 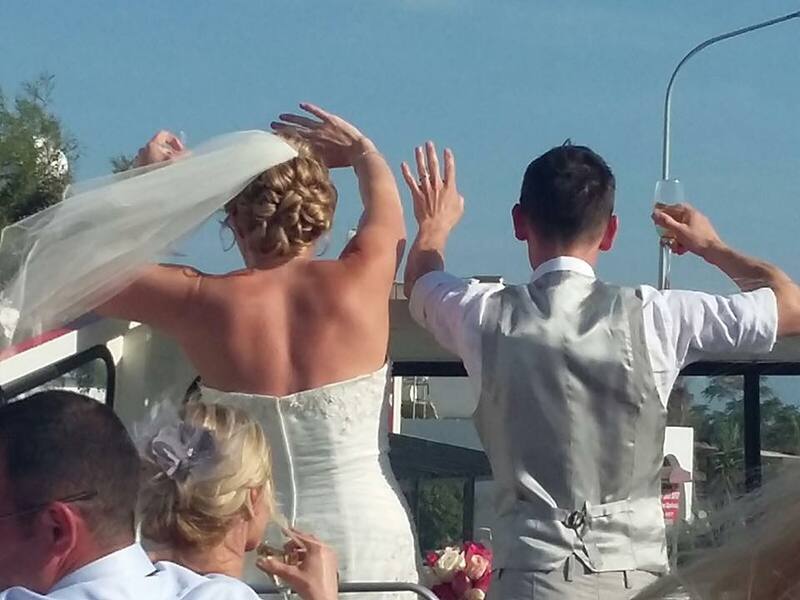 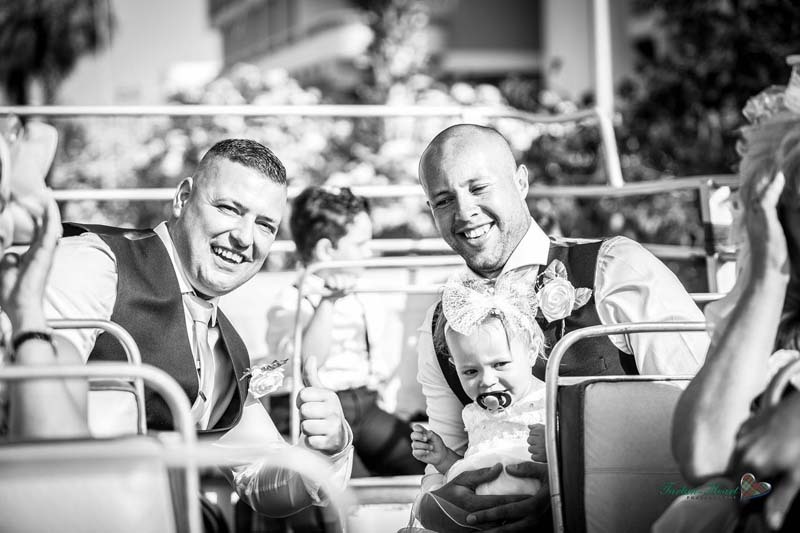 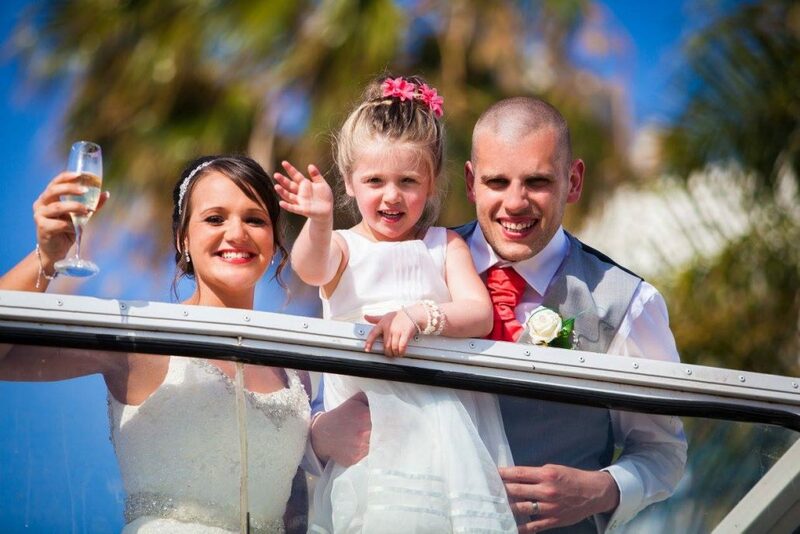 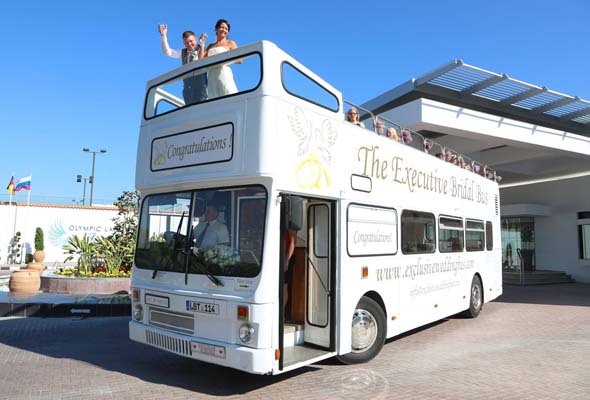 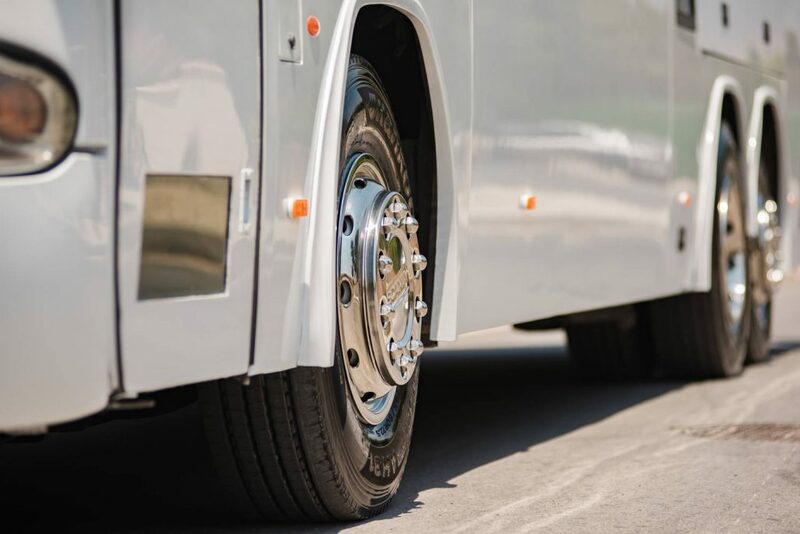 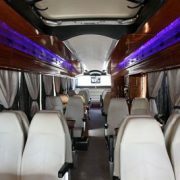 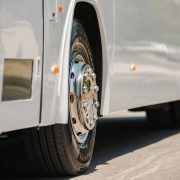 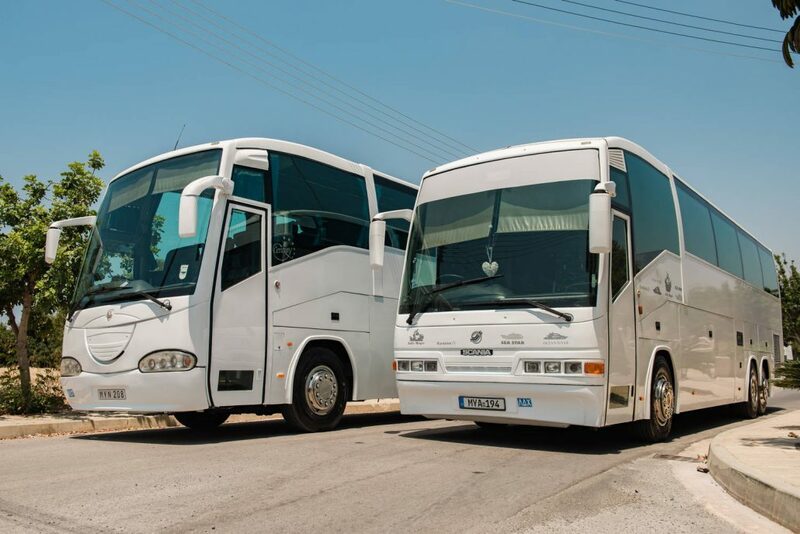 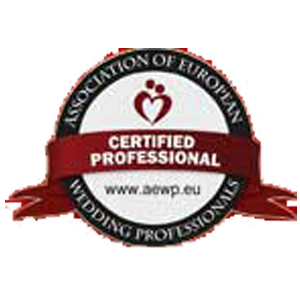 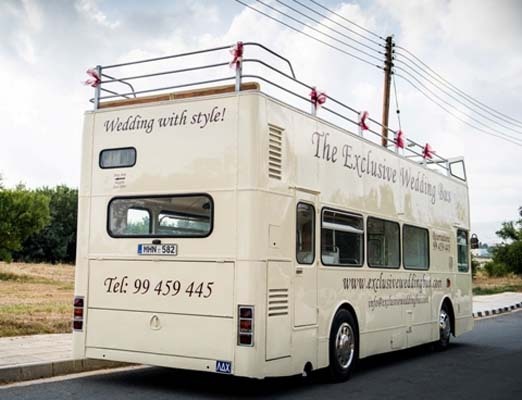 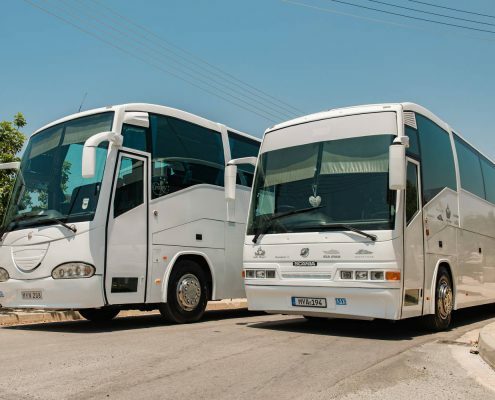 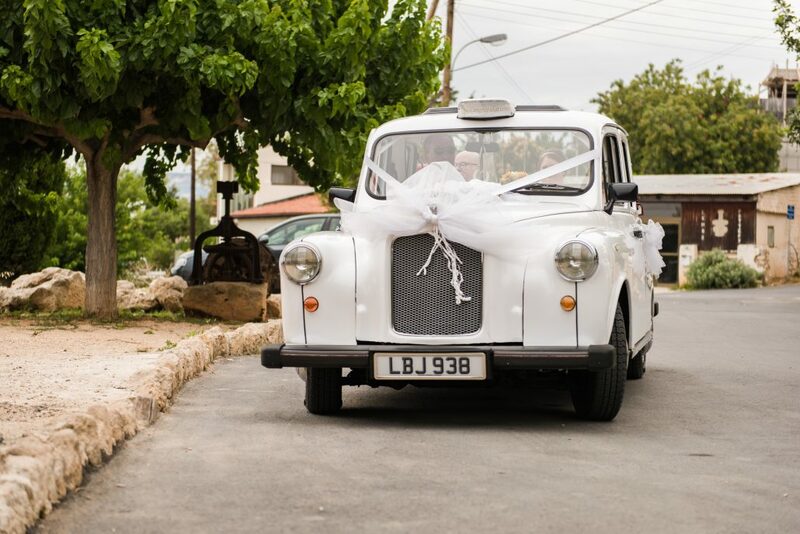 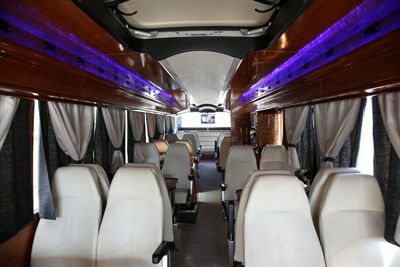 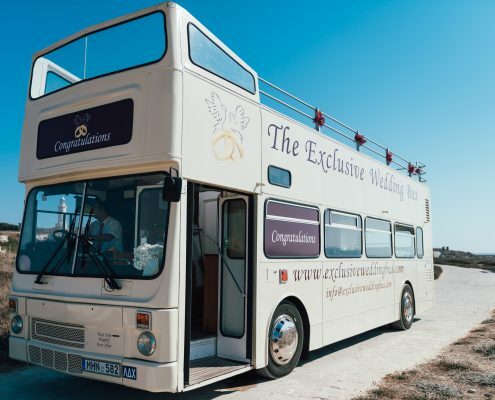 What is the main advantage of using the exclusive wedding bus over conventional limousines? 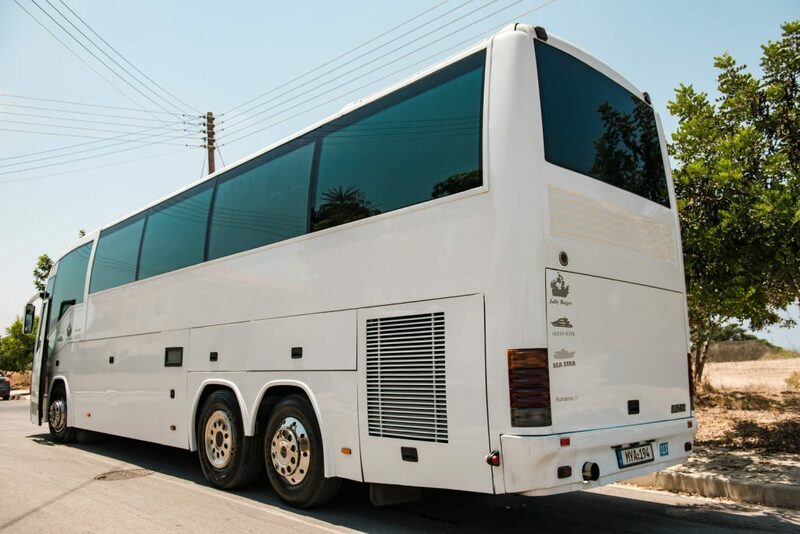 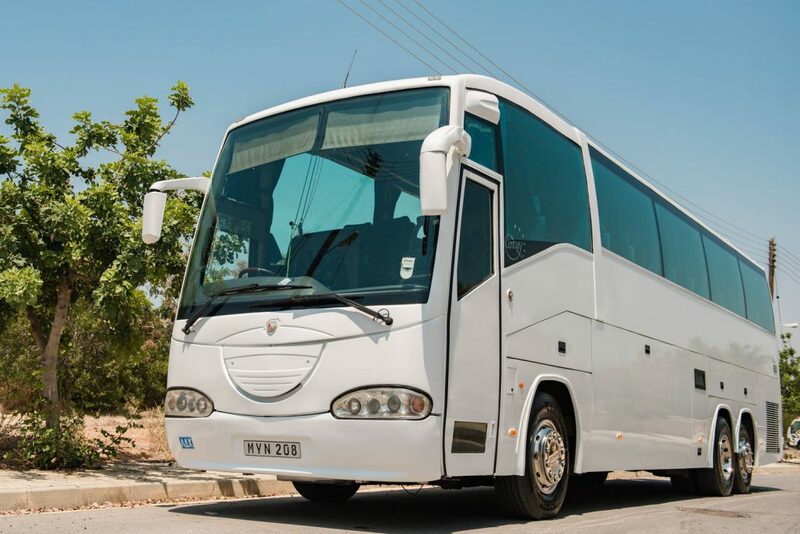 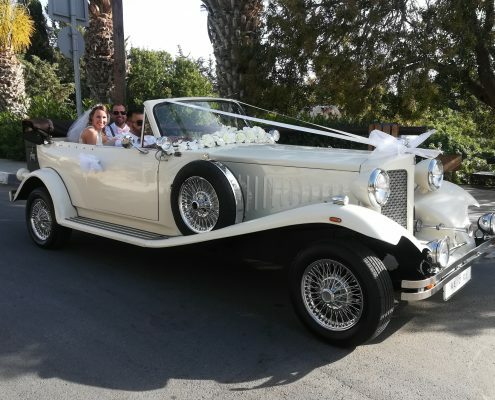 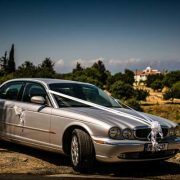 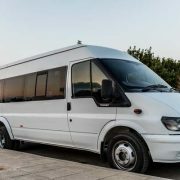 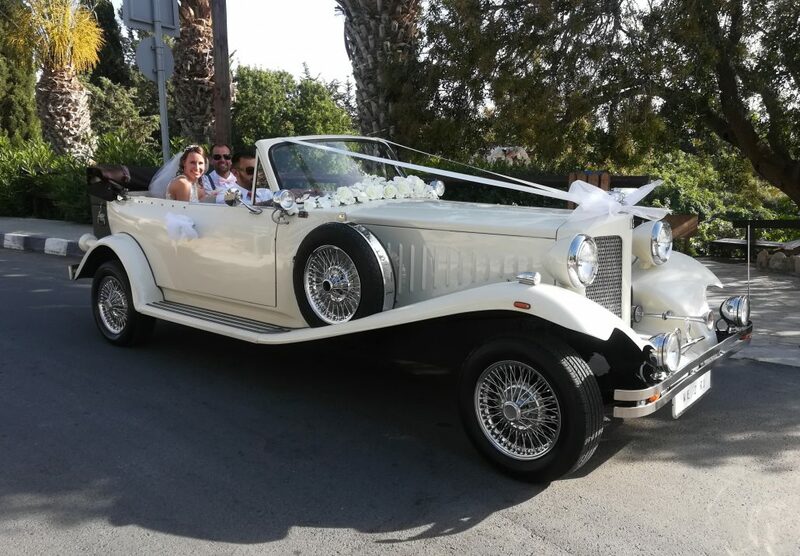 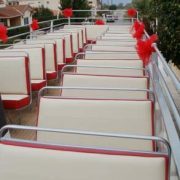 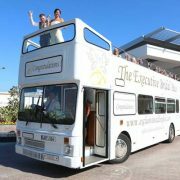 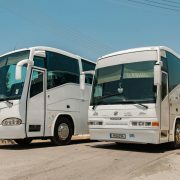 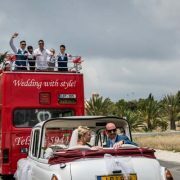 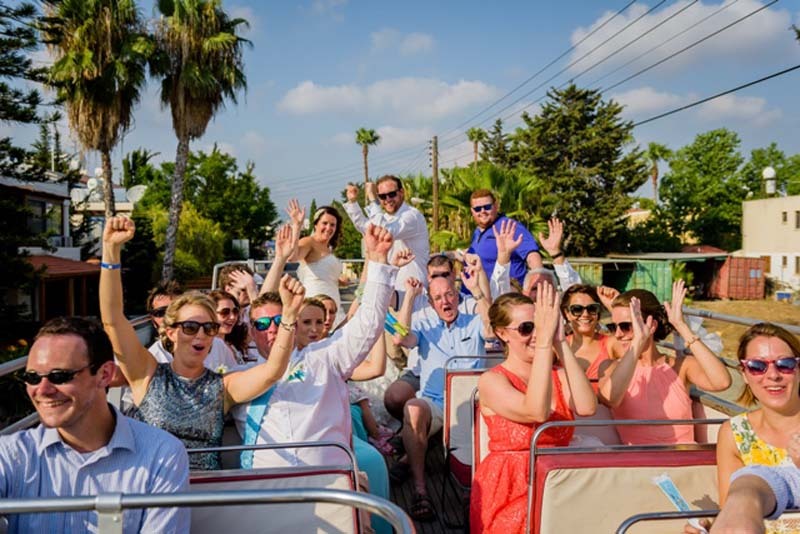 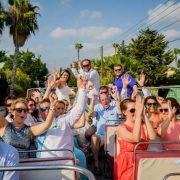 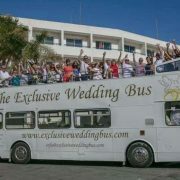 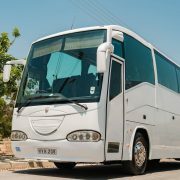 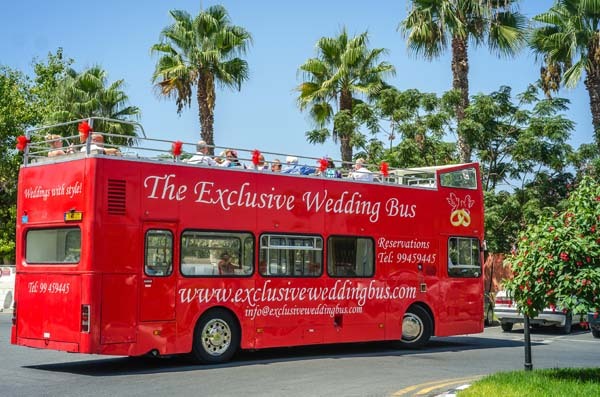 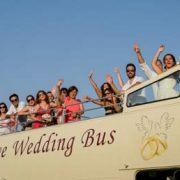 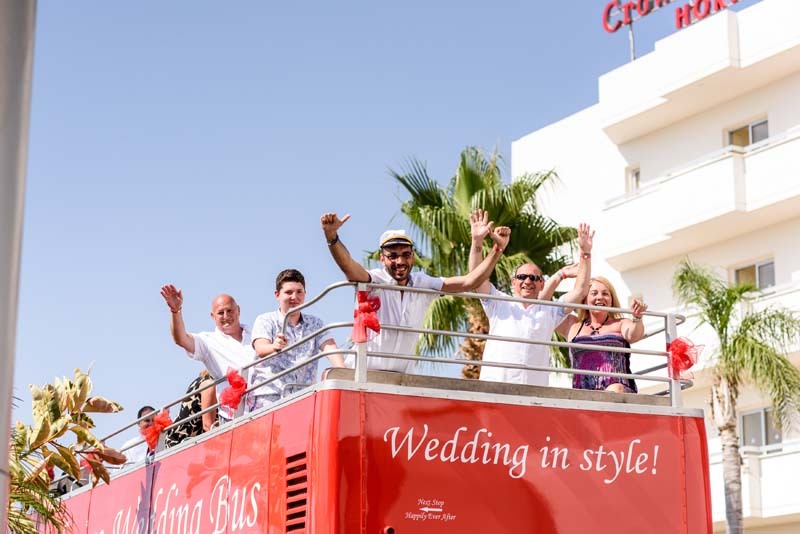 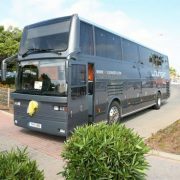 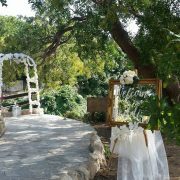 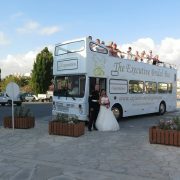 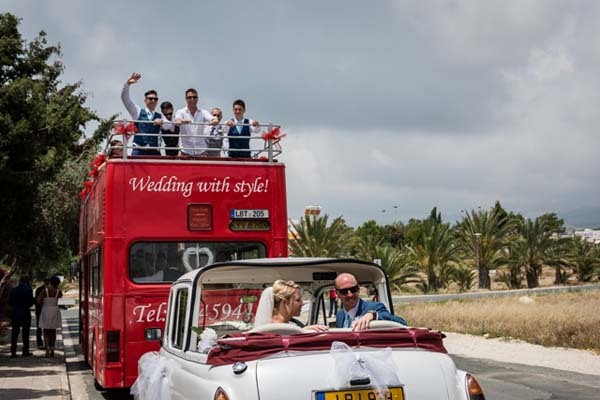 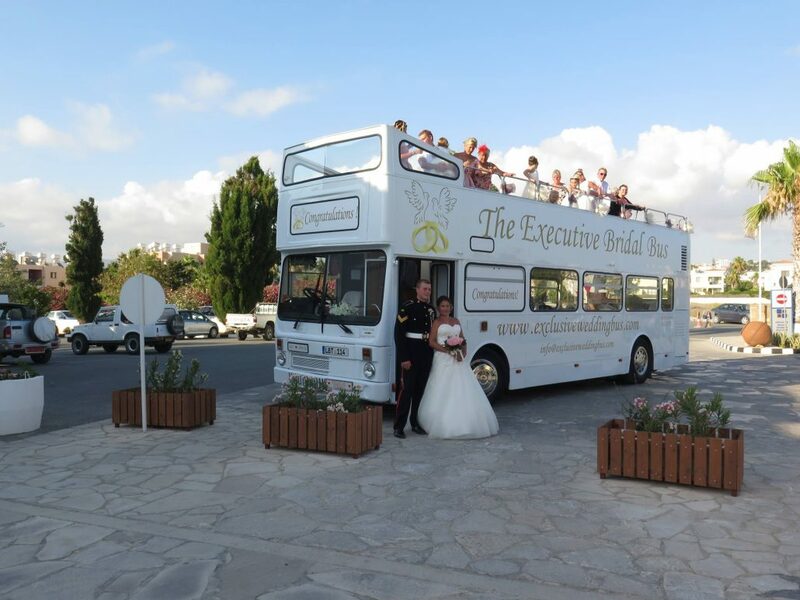 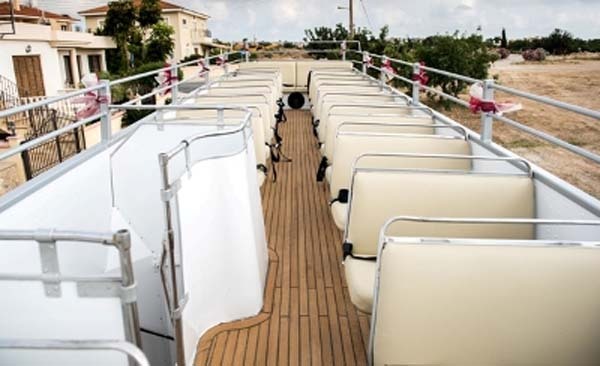 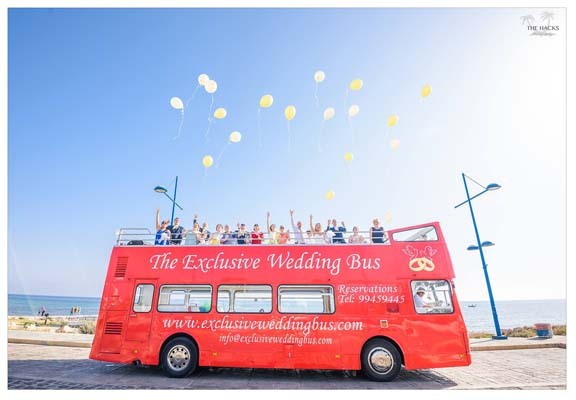 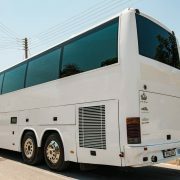 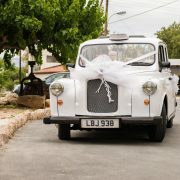 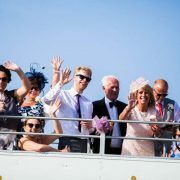 With the Exclusive Wedding Bus you can travel with all your guests from the wedding venue in style and with the tradition in Cyprus to cruise and sound the vehicle horn to alert people of the presence of a newly married couple, most people including tourists will also cheer and wave back and this adds to a truly remarkable day and one you will never forget. 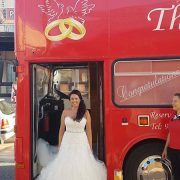 Do people get married on the Bus? 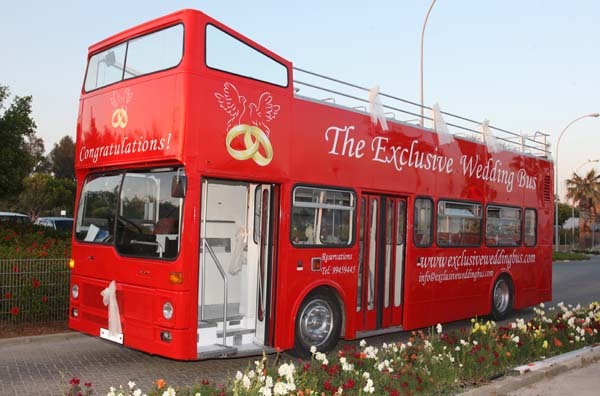 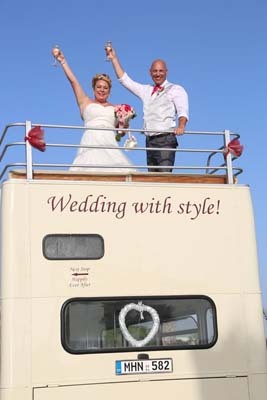 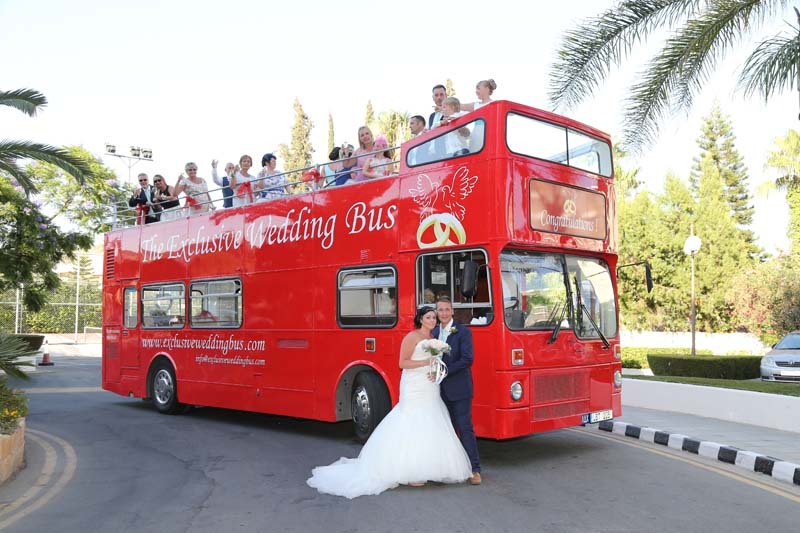 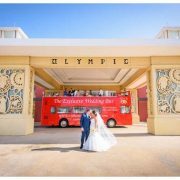 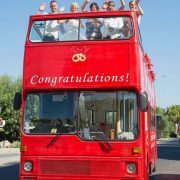 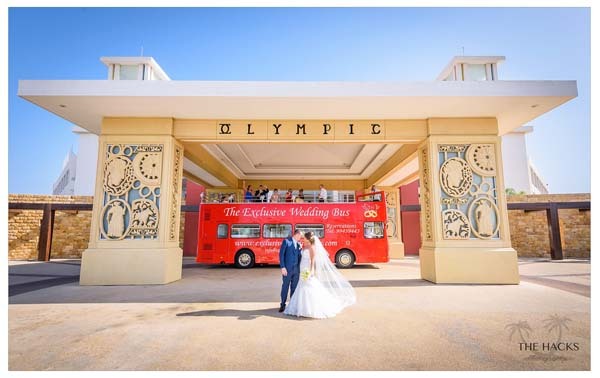 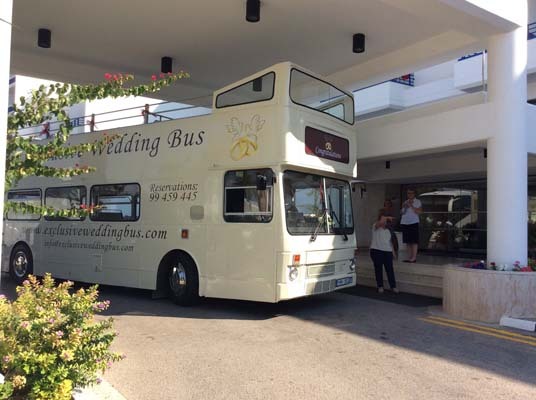 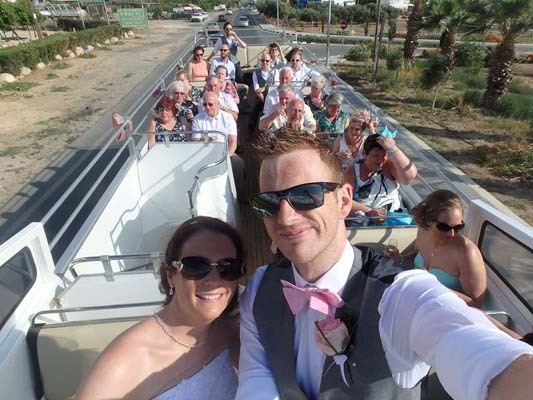 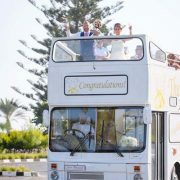 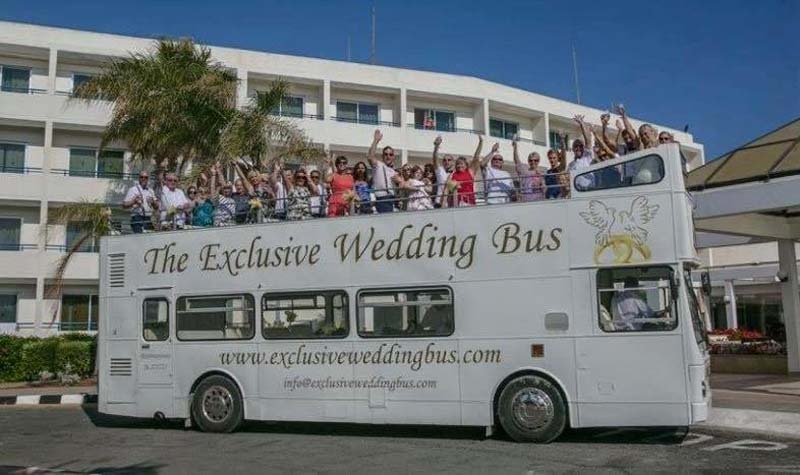 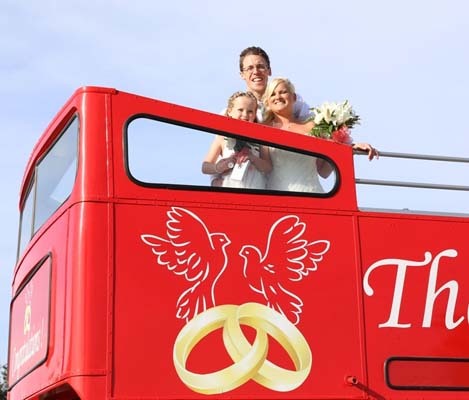 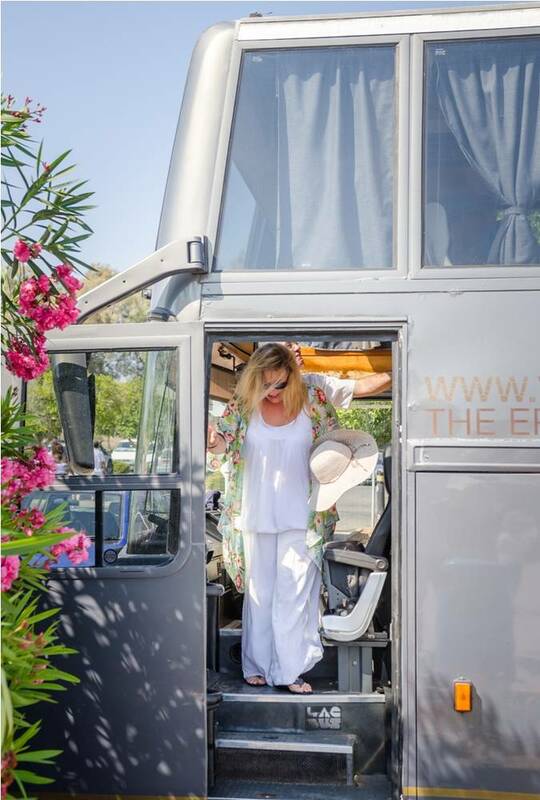 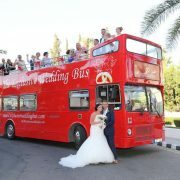 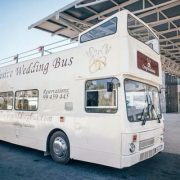 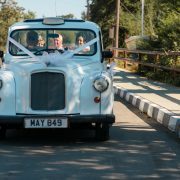 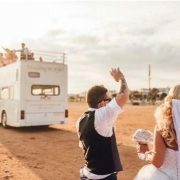 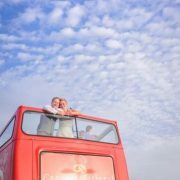 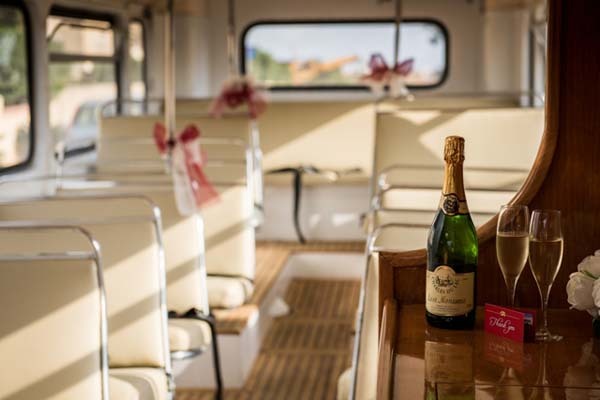 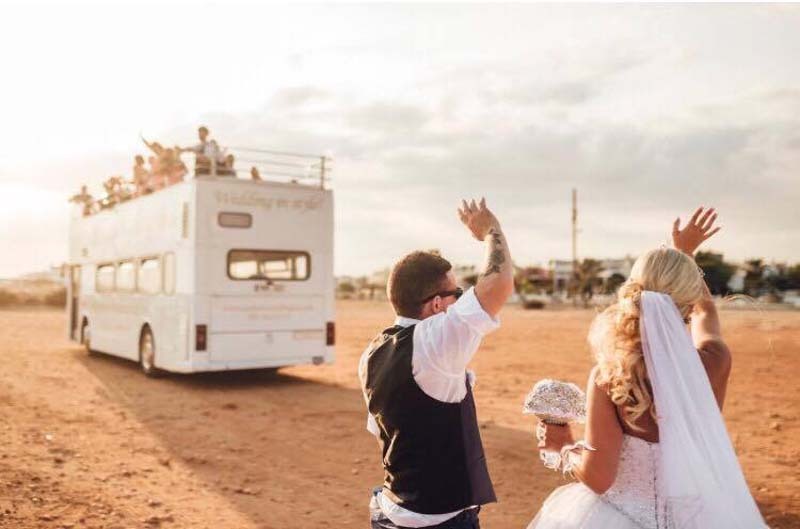 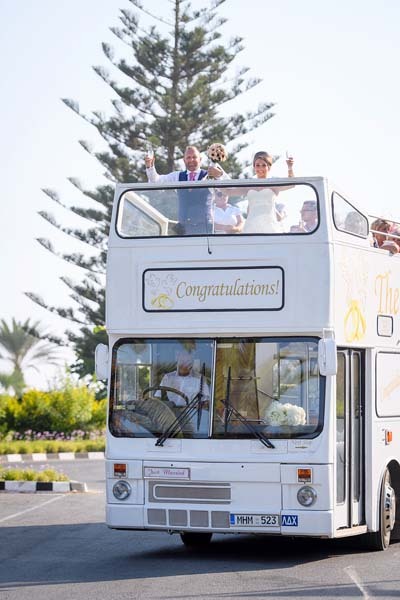 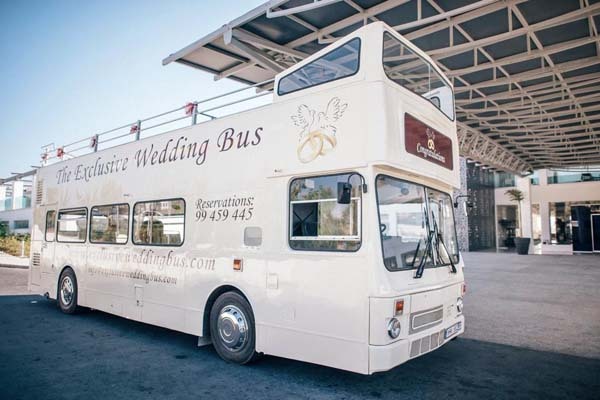 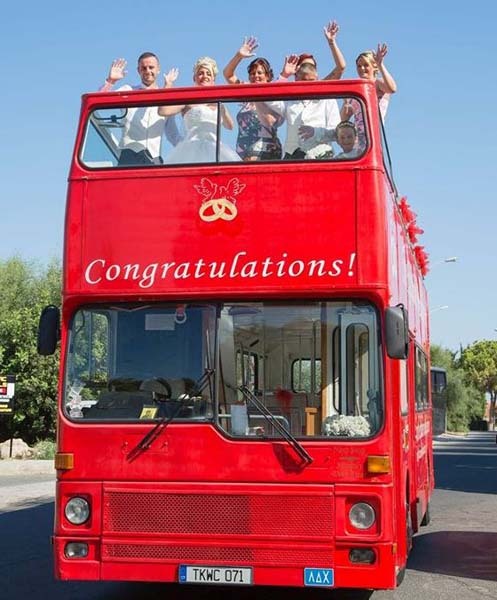 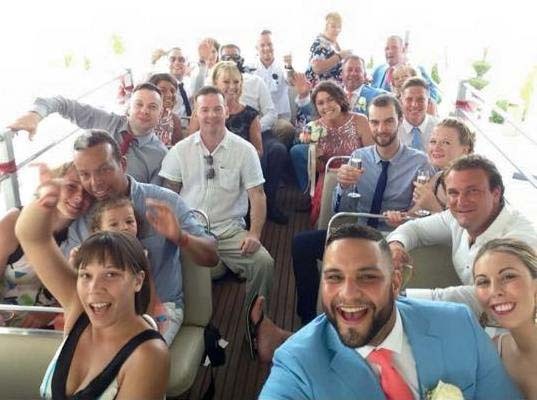 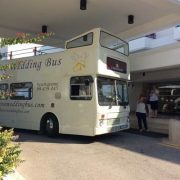 No, the bus is used to take the bride, groom and all their guests to and from the various venues available for the wedding ceremony and reception. 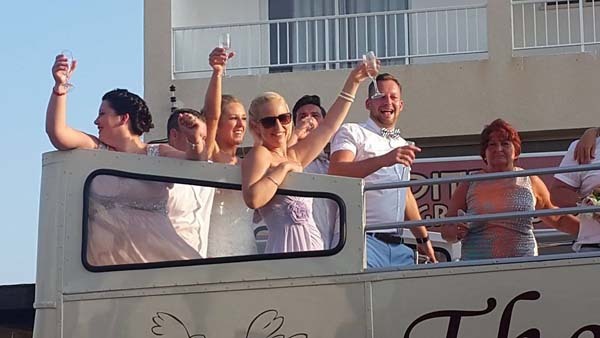 Yes, we have a fully stocked bar and waitress to serve the drinks to you and your guests. 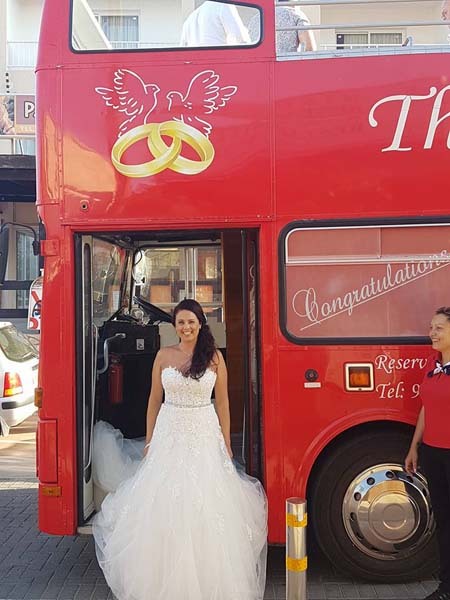 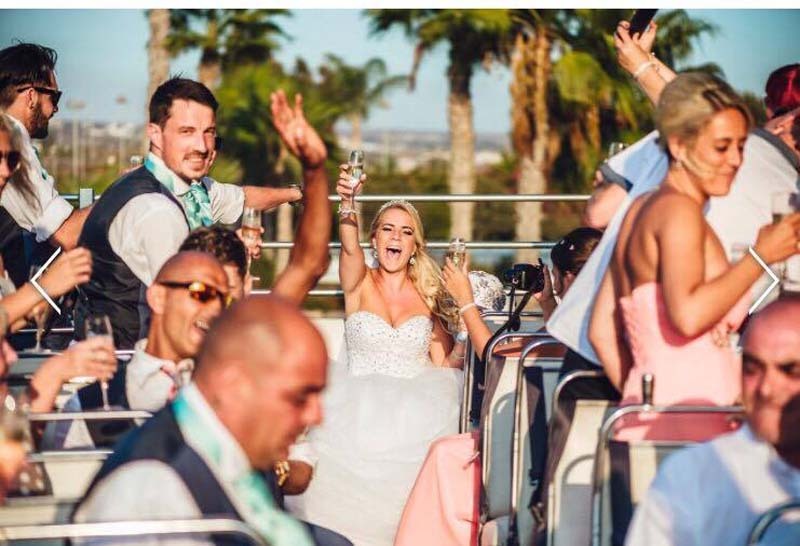 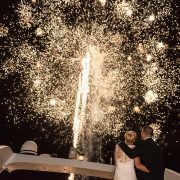 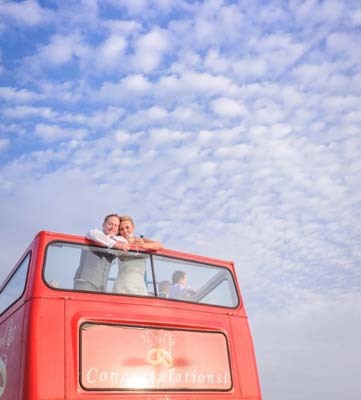 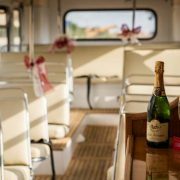 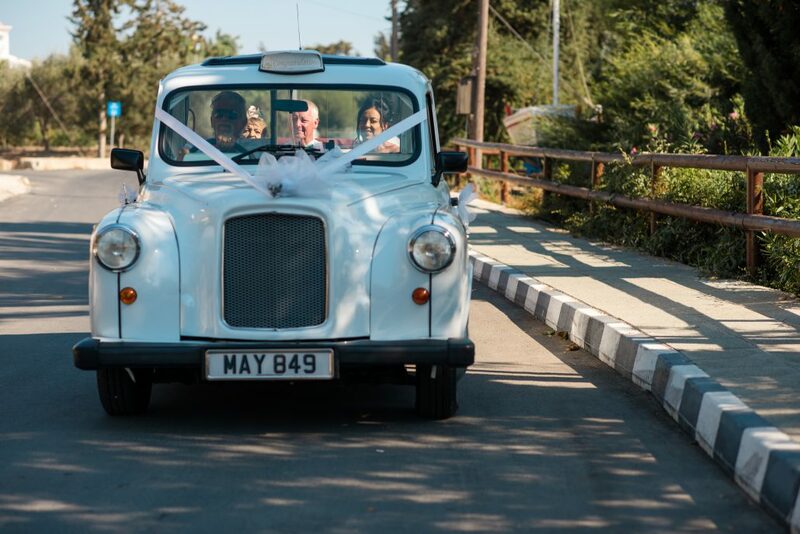 We were married on 31st August 2018 and had the 1.5 hour champagne party bus as a surprise for all our guests. 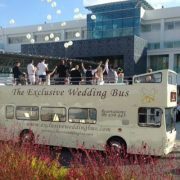 Safe to say everybody loved it from the drinking to the dancing and horn tooting to the reactions of the passers by!! 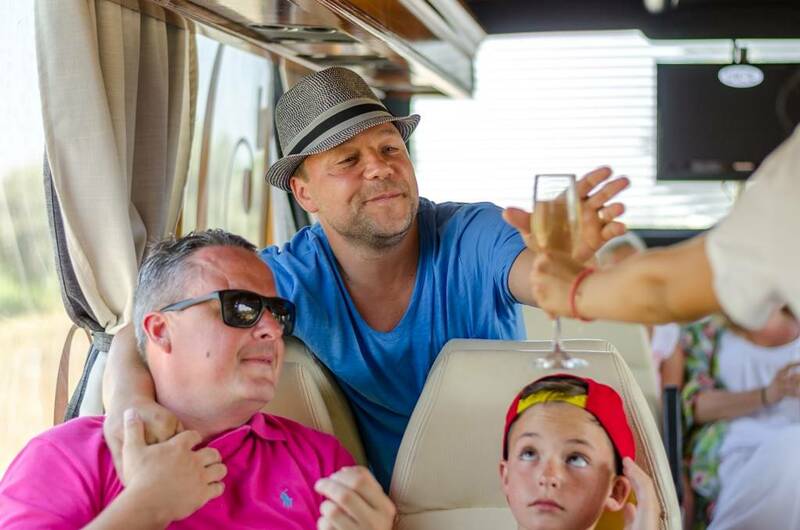 Absolutely amazing time & would highly recommend to anyone… thank you so much!! 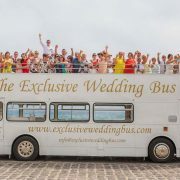 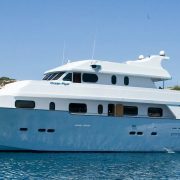 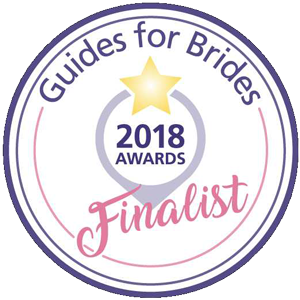 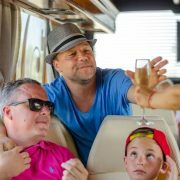 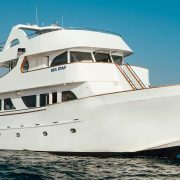 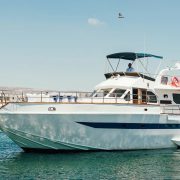 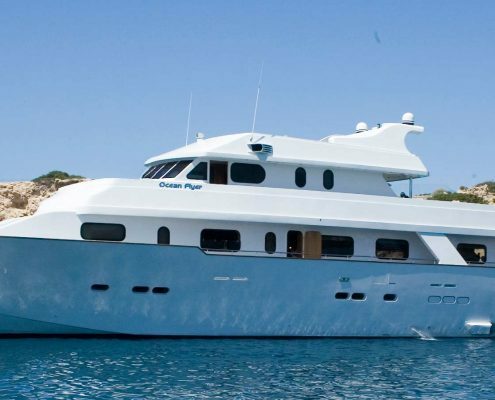 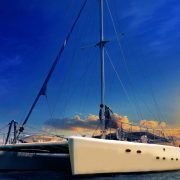 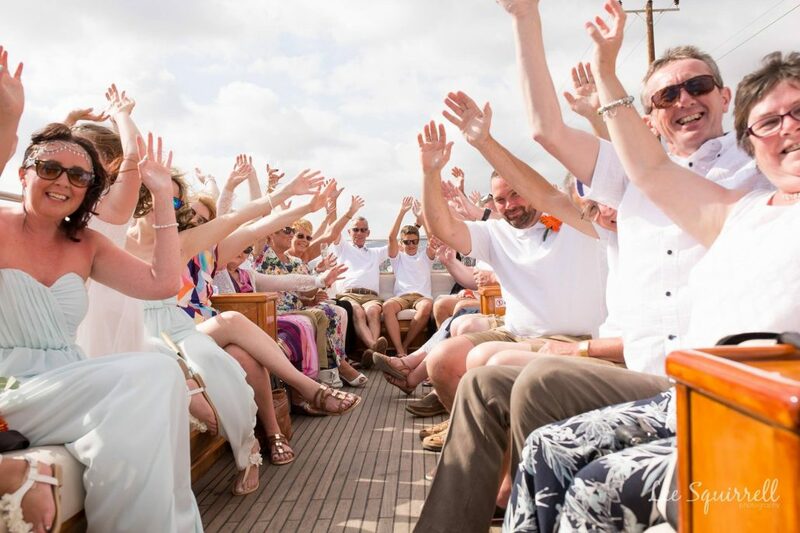 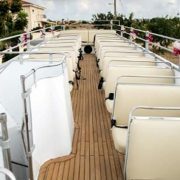 1.5 hour tour for up to 55 people plus a 30 minute photo stop (own photographer), includes 1 glass of champagne per adult and a choice of a drink from the bar. 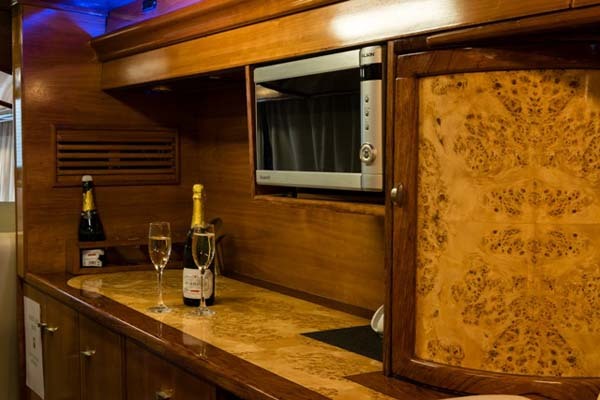 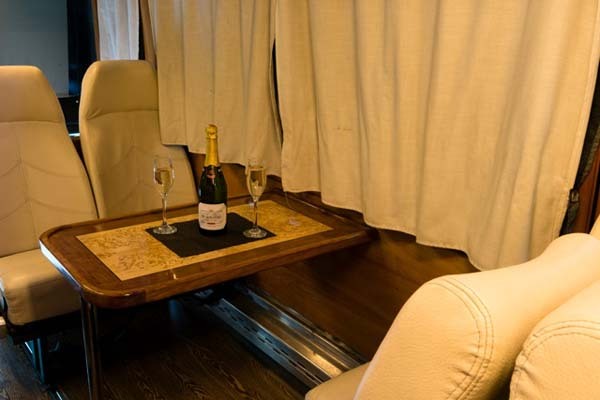 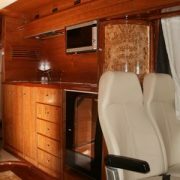 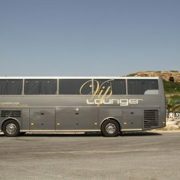 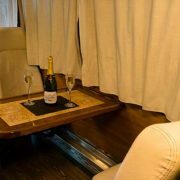 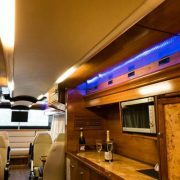 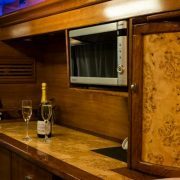 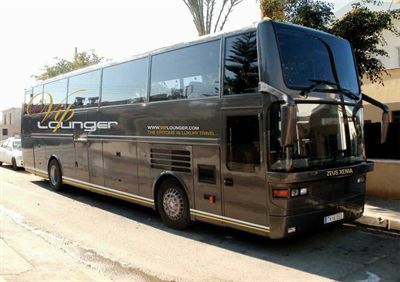 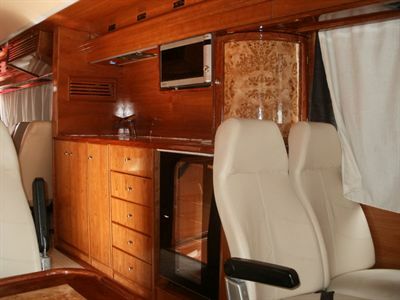 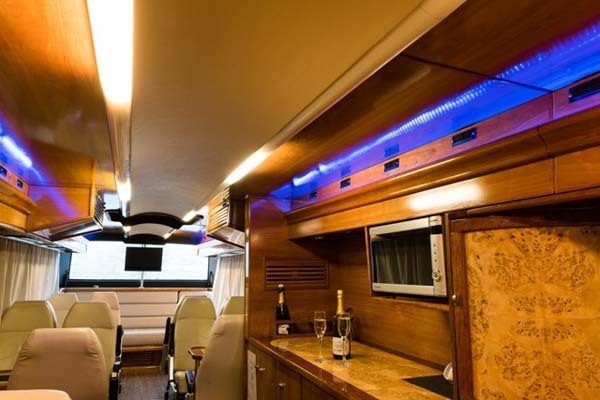 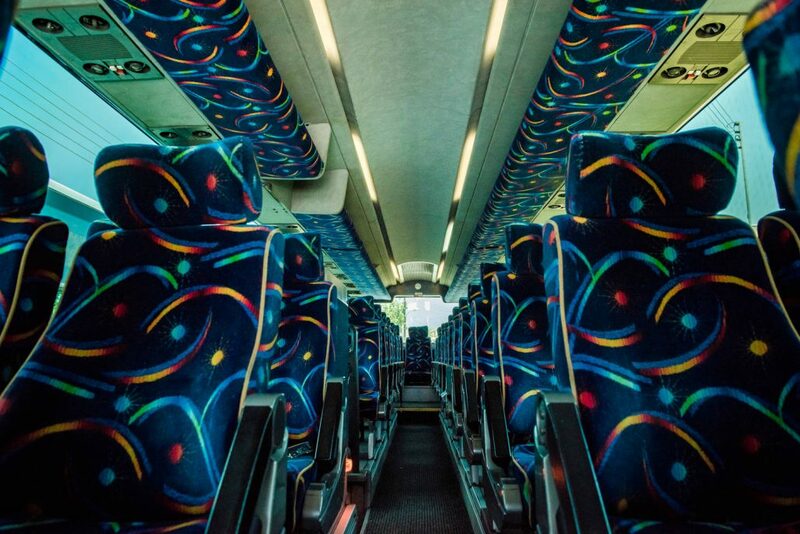 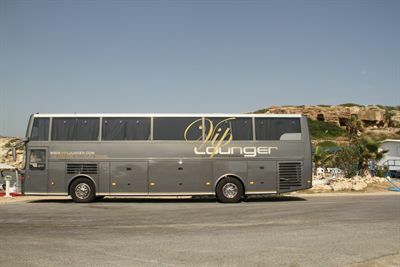 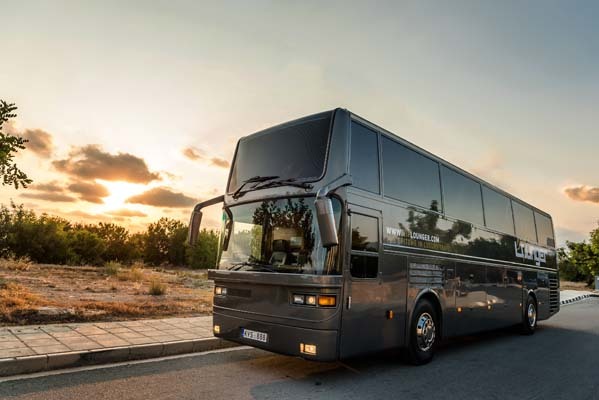 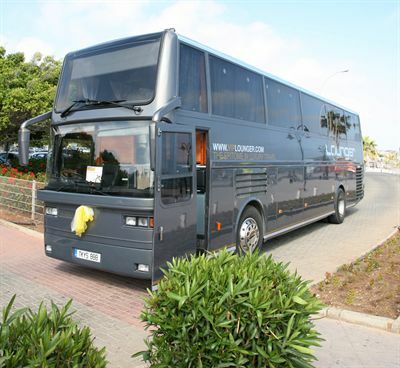 For more information on the VIP Lounger please use our Exclusive Luxury Coach website! 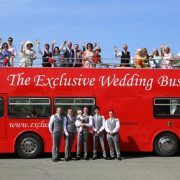 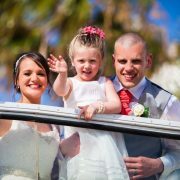 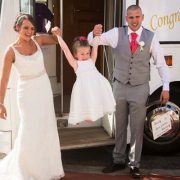 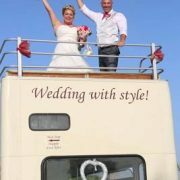 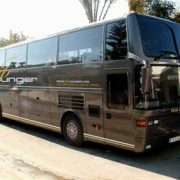 For a full range of wedding bus transport for larger parties please use our Exclusive Luxury Coach website!